When someone makes the decision to make the move to an assisted living facility they will not have room to bring everything with them. That is where Brad Graven comes in to help with the estate sale, he says getting involved with estate sales was never in his plan but he is glad he is now. Graven says there are steps to this process and first things first he knows he needs to sit down with the family and get everyone on the same page. According to Graven it takes about a week to get an estate sale set up and if the house is up for sale there have been instances where the house sells during the estate sale. Graven appeared as a guest on the Newstalk WTIM Morning Show. Central Illinois farmers are once again getting excited for the annual County Financial and Illinois Farm Bureau Winter Meetings. Doug Yoder has had the opportunity to be a presenter at these meetings he says this year he will be discussing some of the new rules and regulations the federal government came out with. Yoder says it can be tricky for farmers if they have ground in multiple counties and can become quite costly for the farmer, this year there is an opportunity to save some cash. Yoder plans to also discuss high risk ground and what impact that can have on the farmers. Yoder appeared as a guest on the Newstalk WTIM Morning Show. Seeing tornadoes in December like the ones that tore through Central Illinois on December 1st is not the norm. Taylorville Fire Chief Mike Crews says a good safety practice is to try to get as many walls as you can between yourself and the tornado. Crews says it is never a bad idea to have an emergency kit on hand in case disaster strikes as power could be out for hours. Crews recalls the growing amount of frustration from the first responders as they were having to fight through the crowds to get to the affected areas. Crews appeared as a guest on the Newstalk WTIM Morning Show. There is more help on the way for Taylorville residents after the December 1st tornado that ran through town. Patty Hornbuckle is the CEO of the Greater Taylorville Chamber of Commerce she attended a meeting Friday afternoon to discuss the SBA establishing a disaster loan outreach center. Hornbuckle says office hours will take place at the Taylorville Fire Department starting January 3rd. Hornbuckle says these are very affordable loans she states that the loans can range anywhere from 200,000 dollars to a couple million. The Big Smile for the Community this month is the City of Taylorville Officials as well as the volunteers and first responders that lent their hands in this crisis. Mayor of Taylorville Bruce Barry says it was amazing how the city came together on the night of December first mere moments after a tornado came through town. Barry recalls the night like it was yesterday and says making sure the proper steps were taken to ensure safety was his first call. Barry says for those that still need help or are looking to help he knows there is still ways to get involved. Mayor Barry would like to thank all of the first responders as well as the volunteers and city officials for all their help. A match challenge, and 4 donations, turned into a 10-thousand dollar contribution for the Missions for Taylorville tornado relief today. Miller Media Group president Randal J. Miller, challenged some of his local advertisers, that he would donate 25-hundred dollars towards Missions for Taylorville, if at least 3 of his advertisers would also contribute 25-hundred dollars each, to turn the total contribution into 10-thousand dollars. Thanks to the generosity of 3 Miller Media Group advertisers—Computer Techniques, People's Bank and Trust, and McMillan Landscape—checks totaling 10-thousand dollars were presented to 2 Missions for Taylorville board members on Friday. Kevin and Dolly Brown serve on the Missions for Taylorville board, and Kevin told Regional Radio News that the need is great. Dolly Brown said the response by the community has been outstanding. Judy Prasun, Assistant Vice President at People's Bank and Trust, told Regional Radio News that the bank was happy to donate. Billy Williams, president of Computer Techniques, said they were grateful to give to Missions for Taylorville. Seth McMillan, owner of McMillan Landscape, told Regional Radio News that he was happy to give since the tornado affected some of his employees. You can find a link to donate on-line to Missions for Taylorville, by clicking the Tornado Recovery Assistance page at taylorvilledailynews-dot-com. With the New Years holiday coming up next week, it is important to stay safe and don’t drive unless your sober. Jessie Decker with the Illinois Department of Transportation warns that it is never okay to drive impaired. Also remember that there are other options if you need transportation whether that is a designated driver, or an app on your phone. Even if you are driving sober, it is still important to be on the lookout according to Decker. Remember this holiday season to drive sober or get pulled over. 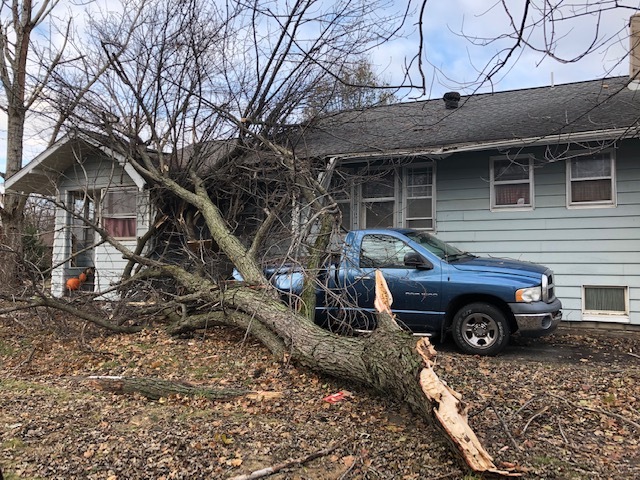 Taylorville residents are still adjusting to life after the December 1st tornado, it has been easier for some than others. Taylorville Fire Chief Mike Crews will not soon forget that day, when he checked with the National Weather Service that morning and saw conditions were favorable. Crews wants to make residents aware what the intent of the sirens are saying that it is meant to get people off the streets and into shelter for safety. It is a tough conversation to have when a loved one is getting to an advanced age where they can no longer care for themselves and are in need of care. Erika Piper is the Director of the assisted living facility Courtyard Estates in Sullivan. Piper says there are normally two ways they get contact with a new potential resident. Piper wants residents to know that there is a lot of freedom at Courtyard Estates, essentially they want their residents to live the same lifestyle they had before. Piper appeared as a guest on the Newstalk WTIM Morning Show. With the winter season rolling through, it is smart to be protect yourself from getting the flu. Dr. Paul Toofan of Taylorville Urgent Care says to stick to the basics and wash your hands. Toofan reminds what typical flu symptons are, and he says it is best to catch it within the first 48 hours. Although we are late into the calendar year, Toofan also mentions that it is not too late to get a flu shot. Also, make sure that if you have the flu to stay away from others because it is contagious. There comes a time in every persons life when they can no longer live on their own and take care of themselves. These situations normally end one of two ways with either a loved one caring for them or an assisted living facility being the destination. Sheila Greuel is the owner of Covenant Transitions, an assisted living facility in Sullivan. She explains what her business is all about. Greuel is frequently asked what all someone will be able to bring, she now shows up to meet every individual with a floor plan that shows exactly how much room is available and what all can be brought. Greuel appeared as a guest on the Newstalk WTIM Morning Show. The Miller Media Group Radio Stations in Taylorville today debuted a new radio station. It's called "Cruisin' 96-point-5", with the slogan "Playing Good Time Rock n Roll", with a signal covering Christian County and surrounding area. The new station plays Top 40 music from 1960 thru 1974, with core artists the Beach Boys, Elvis Presley, Motown artists, the Beatles and other British Invasion groups, and into the early disco era of the early 70's. Company president Randal J. Miller said the station will provide listeners the "feel-good" music that they grew up with. Miller is hosting the station's debut today. Weekends will feature several great syndicated programs that play Top 40 Music from the 60's and 70's. "This is the 60's" airs Saturdays from 10am til noon. "Back ot the 70's" with host M-G Kelly, takes listener requests on Cruisin' 96-point-5 Saturday nights from 6 til 10. Sunday mornings include "Simply Timeless" with Jay Daniels from 6 til 9, and "Live from the 60's" with the Real Don Steele from 9 til noon. Find out more information on the new "Cruisin 96-point-5" on taylorvilledailynews-dot-com or on the new station's Facebook page. As 2018 is coming to an end many are thinking of new years resolutions. As for Avery Bourne she is thinking about 2019 and the new legislatures that will be joining her. Bourne represents the 95th District of Illinois in the House of Representatives, she encourages everyone to watch the lame duck season which happens before the new administration takes office. Bourne wants residents as well to be aware that 250 new bills will become laws on Jan first, a couple of the heavy hitters revolve around gun restrictions. Bourne says her office is always open to new ideas to draft into bills that she hope to someday turn into law, simply reach out to her office if you have any ideas. The American Legion is the largest wartime veterans service organization aimed at advertising patriotism in the United States. Ann Stock is with the American Legion in Shelbyville she says as an organization they really like to put an emphasis on local involvement. Stock shares how American Legion baseball as always been popular and every year they will sponsor multiple teams. Stock appeared as a guest on the Newstalk WTIM Morning Show. Being involved with the U of I Extension Office and having the opportunity to get into the classroom and teach the younger generations can be a rewarding process. Rebecca Livingston is the 4H and Ag Literacy Program Coordinator with the U of I Extension Office in Taylorville. Coming up in January they are hosting their teen teacher training workshop in Hillsboro. Livingston says the workshop is an all day event and while taking the workshop the teens will both have the opportunity to be taught and do the teaching. The Shelby County Health Department is fighting their hardest to make sure that everyone in Shelby County is living a healthy and happy lifestyle. Jeri Danneberger (Dan-Eh-Burger) is with the Shelby County Health Department she wants to share a program they are offering that will make a difference in your child's life. Danneberger says there is also a program the Shelby County Health Department is offering that is for kids who may need regular check ups throughout their lives up to two years old. Danneberger appeared as a guest on the Newstalk WTIM Morning Show. 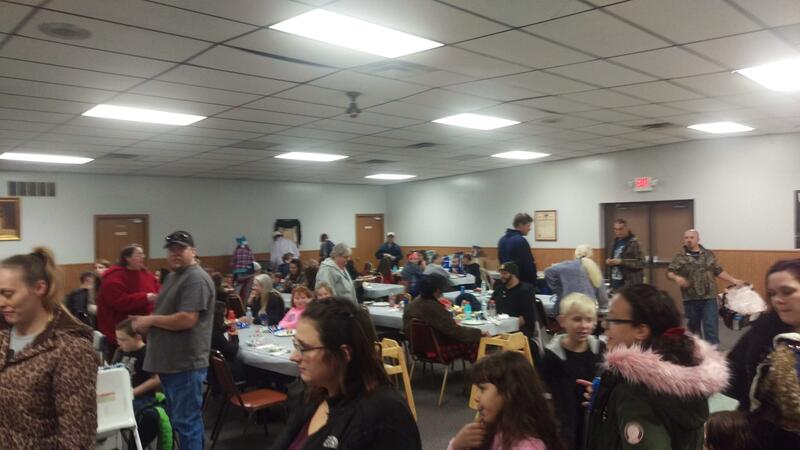 It was standing room only during Sunday’s Community Wide Christmas Party at the Taylorville Moose Lodge, as several local agencies co-hosted an event to begin the healing process after the December First tornado. Taylorville mayor Bruce Barry, Chamber C-E-O Patty Hornbuckle, and C-E-F-S executive director Jodi Rusher spearheaded the event. Hornbuckle told Regional Radio News that the attendance was overwhelming. Hornbuckle added each child that came to the event, got 5 tickets to pickup 5 toys from the thousands of toys provided. Hornbuckle says the event was an example of people showing love for their community. Taylorville mayor Bruce Barry spoke to Regional Radio News while serving hot dogs to families. And, Santa Claus made a visit to the Community Wide Christmas Party in Taylorville on Sunday as well, visiting with hundreds of children. United Methodist Church of Morrisonville is hosting a community blood drive January 8th. Donor Relations Consultant Libby Bair says they are looking for anyone to come out and donate, and they are offering a special gift for those who do. Bair reminds that there is always a need for blood, so donating is highly encouraged for anyone who is interested. Bair recommends that anyone interested in donating for the Morrisonville blood drive should schedule an appointment ahead of time. The drive will run January 8th from 3-7 in the evening. While the student are enjoying their time off during Christmas breaks instructors are trying to do the same while still having an idea of what lesson plans they will have when classes return. Cathleen Agney is with the Shelby County Farm Bureau she has been in charge of Ag in the Classroom for the last three years and says none of them have been alike. Even with three different bosses during her three year tenure Agney loves what she does, she explains her approach to Ag in the Classroom. Agney appeared as a guest on the Newstalk WTIM Morning Show. The 6 Miller Media Group Radio Stations presented the third in a series of programs titled "A Season of Hope" on Friday afternoon, to assist the Taylorville community in recovery following the December First tornado. Among the guests during the program was Bob Cook, Associate Pastor at the First United Methodist Church in Taylorville, who told listeners that their church has established an emergency coordinator who is directing out of town volunteer teams to assist tornado victims. Cook added that tornado victims can access these volunteer teams by calling Jamie at the First United Methodist Church in Taylorville, at 824-2782. Other guests on the Friday program were 3 members of the church's Stephen Ministry, that all worked at the Multi-Agency Resource Center when it was open earlier this month. Brenda Patrick said the event blessed her. Another member of the Stephen Ministry, Linda Lytle, said working at the Center that weekend was very humbling. Diane Lowery, another member of the Stephen Ministry, said many victims were very humbled and didn't want to take more assistance. 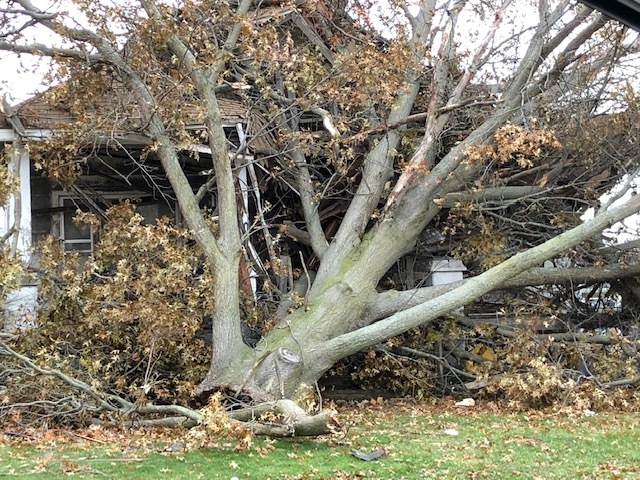 Tornado victims can access the 2 volunteer teams at the First United Methodist Church in Taylorville to have them assist in debris cleanup and other services, by contacting Jamie at 824-27-82. Last Saturday the Greater Taylorville Chamber of Commerce was at the fire station in town selling T-shirts and hoodies to all who stopped by. CEO of the Greater Taylorville Chamber of Commerce Patty Hornbuckle says the Chamber will once again be selling those T-shirts and hoodies this Saturday but this time they will be at the US Bank building. Hornbuckle says the Chamber is trying to do their part in the tornado relief for the city as she knows there is a long road ahead back to normalcy for this community. Local residents have been finding all sorts of ways to donate to Taylorville as the city continues to recover from a catastrophic December tornado. Most recently, a few local business donated money for fuel used by the cities dumb trucks while cleaning debris. Mayor Bruce Barry on how helpful the donation was. Perhaps the most common donation collected has been money. Mayor Barry says donations have come from as far as England. All monetary donations should be given to Missions for Taylorville. The University of Illinois Extension Office is looking forward to spending the holiday season with their families as are many central Illinois residents. Rebecca Livingston is the 4H and Ag Literacy Program Coordinator with the U of I Extension Office in Taylorville. She says after the ball drops to ring in the new year they are right back to work with a craft workshop. Livingston says these craft workshops are nothing new to the Extension Office as they try to do a couple every spring and fall and normally go pretty well. It’s been a few weeks since an EF-3 tornado hit Taylorville on December 1st. Since then, emergency crews have been hard at work providing relief, and assessing damage all throughout the city. Taylorville Fire Chief Mike Crews has completed a full report with all information gathered in the aftermath of the tornado. Crews mentions right away that it’s always important to be prepared for these storms any time of the year. Crews says that storm was so strong it produced a tornado emergency, which is not common in these situations. It eventually led to the cancellation of a downtown parade. 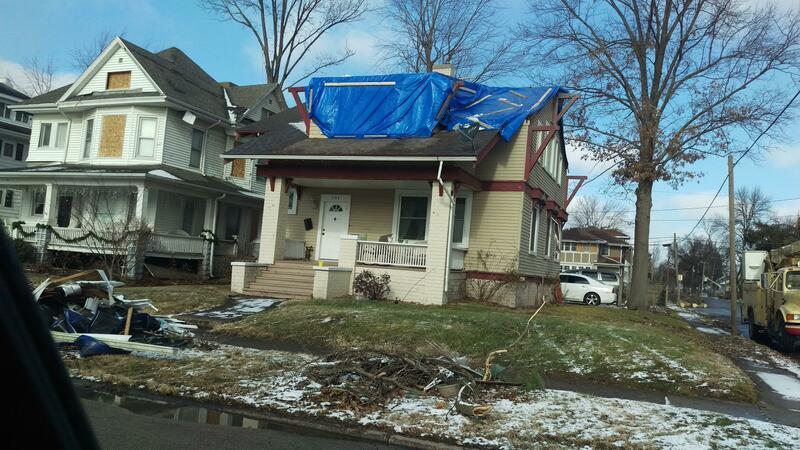 With the storm producing wind speeds around 150 miles per hour, a lot of structures were damaged. Crews shares the final numbers in his report as well. Taylorville continues to recover from the storms aftermath. It is time to be in the holiday spirit as residents everywhere are looking forward to Christmas and New Years. Danna Lewis with the U of I Extension Office says it is also time to start thinking about your spring garden and the necessary steps to take to ensure yours is the best in the neighborhood. Lewis says three guest speakers are already lined up for the February event that will make sure you leave with the knowledge to grow a happy and healthy spring garden. Lewis appeared as a guest on the Newstalk WTIM Morning Show from the Metro Communications Building in downtown Sullivan. 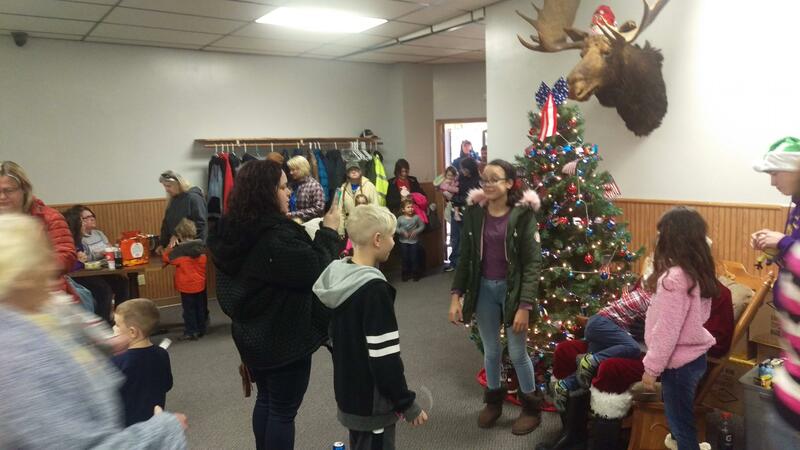 The Greater Taylorville Chamber of Commerce is holding a Community Wide Christmas Party at the Taylorville Moose Lodge on Sunday. Taylorville Chamber CEO Patty Hornbuckle says the idea came from Mayor Bruce Barry. The event is also something new that Taylorville is doing. The Taylorville Community Christmas will be a first time event. The Christmas Party will be from 1 to 3 in afternoon on Sunday, December 23rd. When the snow starts coming down parents are often waiting to hear word from the schools whether or not it is a snow day. Ted Walk is the Superintendent of Sullivan Schools. He says inclement weather boils down to one thing, student safety. Walk says there is a new component this year that they are hoping will help them keep the doors open and the students getting their education. Walk appeared as a guest on the Newstalk WTIM Morning Show from the Metro Communications Building in downtown Sullivan. The Sullivan Chamber of Commerce has been seeing growth for quite some time now and with every new member that joins excitement shows in the city. Darvy Beery is a local shop owner in Sullivan, she recalls when she first decided to join the Chamber and all the good it has done for her. Beery says there is a long time goal the Chamber has had in Sullivan that has finally been checked off. Beery appeared as a guest on the Newstalk WTIM Morning Show from the Metro Communications Building in downtown Sullivan. Christmas in the Park started back on December 7th in Manners park. Recreation Director for the Taylorville Parks District Bailey Hancock says this year has been one of the most challenging years for Christmas in the Park. This year at Manners Park, there are more than 100 displays to be seen. Although the amount of cars that have come through is down so far this year, Hancock says that there is always a rush closer to Christmas. The last day for Christmas in the Park will be Christmas day from 5 in the afternoon until 10 at night. At 5:30 in the evening on December 1st Taylorville residents started making their way out of their homes to look at the damage the EF3 tornado had done. Mayor Bruce Barry says that damage is still being assessed from the tornado that came through Taylorville, he says over 700 homes received damage. Barry also wants to extend the most heartfelt thank you to the Illinois politicians that stopped by Taylorville to reassure residents and put them more at ease. 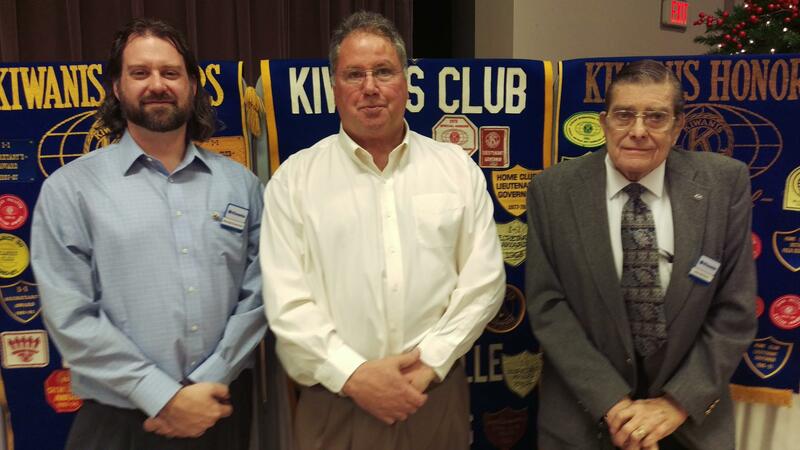 The Taylorville Kiwanis Club heard the “State of the City” address from the Taylorville mayor, during their weekly luncheon Tuesday. Mayor Bruce Barry said the community is more optimistic than it’s been in a long time, citing the many areas of town that’s expanding or new construction taking place. Barry added that he’s enjoyed being mayor of Taylorville the past 18 months, and is pleased with the progress he and the city have made during that time. Barry said that during his tenure, police and fire department union contracts have been signed, and he’s working towards getting a new agreement with another city labor union. He then turned his remarks toward the December First tornado, saying that some 13 fire departments and 15 ambulances from outside of Taylorville, plus local first responders, showed up in the hours after the disaster, doing search and rescue in the areas affected. Barry complimented the huge volunteer effort from outside the city, which helped in clearing debris in the days immediately after the tornado. Above is Kiwanis president Michael Evanchak, who presided at the meeting; Mayor Barry; and Kiwanis program chair for Tuesday John McClure. 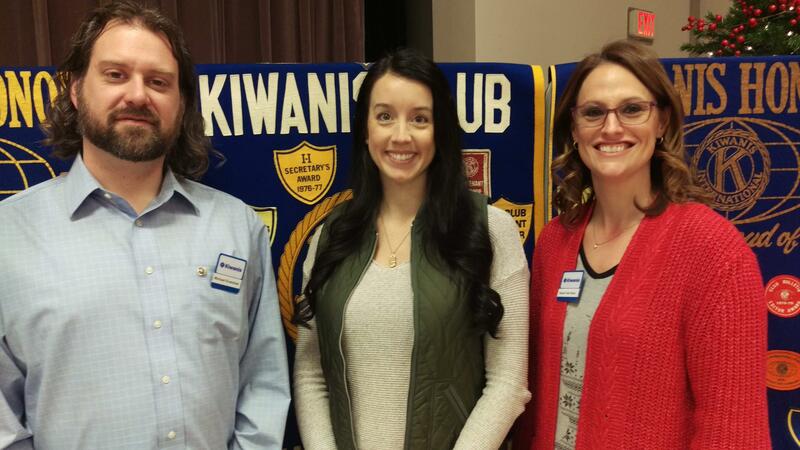 Sarah Brockelsby (center) was inducted as the newest member of the Taylorville Kiwanis Club during their Tuesday meeting. Brockelsby was sponsored by Kiwanis member Sarah Van Huss (right). Kiwanis president Michael Evanchak is at the left. Henry and his company like to be on the look out for orphan stocks, essentially these are the forgotten stocks that no one seems to pay much mind and Henry and his company try to get in on the good ones. It can be difficult to figure out which orphan stock is a good one compared to a bad one, Henry says it comes down to research to make sure you are making the right call. Staff members of the Miller Media Group in Taylorville, unanimously decided to forego their 100-dollar gift card bonuses provided every year by the company, and instead give that 100-dollars per employee, to the Missions for Taylorville tornado relief fund. The company then matched the employees' total of 700-dollars, and a check for 14-hundred dollars was presented to Pastor Bill Kerns with the Missions for Taylorville committee Tuesday afternoon at the radio stations' studios. Pastor Kerns told Regional Radio News that the donation by Miller Media Group employees, will make a difference in a person's life recovering from the December First tornado. In the photograph are, from left to right: Harrison Silcox, news and sports reporter; Kami Payne, general manager; Jon Bowen, staff announcer; Pastor Bill Kerns representing Missions for Taylorville; and Teresa Nelson, account manager. Also contributing but not in the picture include Danny Russell, staff announcer; Vonda McConnell, account manager; and Katie Kohl, administrative assistant. You can donate to Missions for Taylorville on-line by clicking the "Tornado Recovery Assistance" icon at taylorvilledailynews-dot-com. Applications to participate in the Christian County C-E-O, or "Creating Entrepreneurial Opportunties" program for the 2019-2020 school year, are now being accepted on-line. High School Seniors in Christian County, are eligible to apply to participate in the program, which meets during school days from 7:30 til 9 in the morning to learn business and entreprenurial skills. Apply on-line by going to christiancountyceo-dot-com, then clicking the "student recuitment" button. Applications will be reviewed by a committee made up of Christian County C-E-O board members, and those accepted will be notified in early spring. The Christian County C-E-O program, now in its 4th year, is totally supported by donations by local businesses and individuals. Avery Bourne represents the 95th District of Illinois in the House of Representatives. On December 1st a tornado ran through pretty much the entire district she represents. Bourne says she started getting calls early on in the night as it was evident the tornado was coming their way. In the time since the tornado Bourne and her office have been trying to assist in anyway they can. The City of Taylorville is still dealing with clean up around the area as donations have been coming in from across the United States. Avery Bourne tips her cap to Congressman Rodney Davis as he is working at the federal level to try and help with expenses. Last week, the new Farm Bill was passed in the house, and Congressman Rodney Davis, representing the 13th district of Illinois, knows that the passage means a lot to the areas that he represents in Illinois. Davis says that the new Farm Bill will help organic farmers as well. However, there are some parts that he wishes he could still change. It was a long process to put this new Farm Bill together, and Davis knows there are still things to work on in the future. The bill passed by a vote of 396 to 47. As Taylorville residents are still sorting through debris and recovering from the December 1st tornado they are working with their insurance agents to make sure they are covered. Dan McNeely is with Dimond Brothers Insurance he says the day after the tornado on December 2nd his office was filled with all his coworkers ready to get through claims. McNeely was one of the first insurance adjusters on the scene that Sunday morning to assess the damage done. He recalls making his way down Houston Street in Taylorville. Mcneely appeared as a guest on the Newstalk WTIM Morning Show. It was a quick meeting on Monday night for the Taylorville City Council. They held their second meeting of the month at 7 in City Hall. After a quick update from the city attorney, Mayor Bruce Barry gave his Mayoral Update. He wanted to thank everyone who has helped the city in the aftermath of the tornado. After that was the committee reports. The only committee discussed was the Water and Environmental Committee, and all of those motions cleared unanimously. The Taylorville City Council meets on the first and third Monday on every month. You can watch the full city council meeting here. 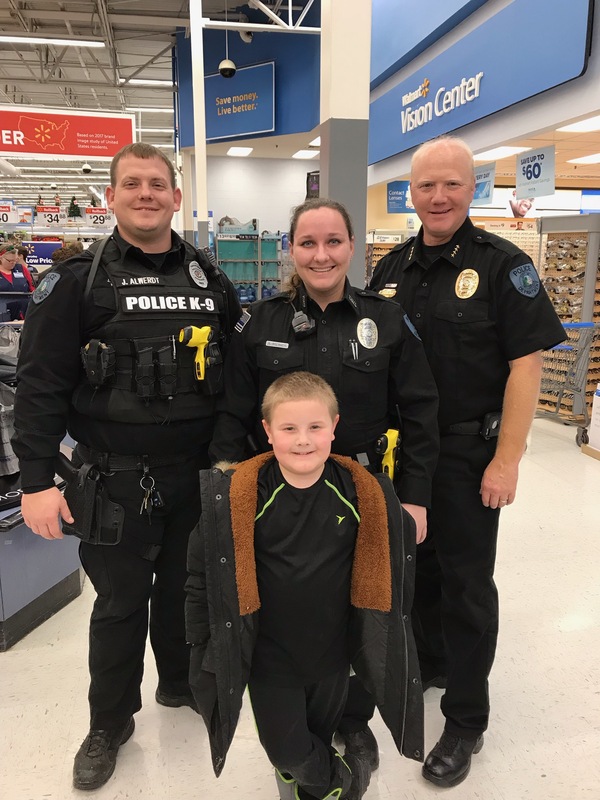 Kids, Cops, and Christmas was December 13th, and the Taylorville Police Department took kids Christmas shopping. Police Chief Brian Hile says everyone was appreciative. Hile says that this years’ event came with a different feeling after the tornado that hit Taylorville December 1st. Overall, Hile describes the experience as good for the kids, but rewarding for the officers to be able to give back. 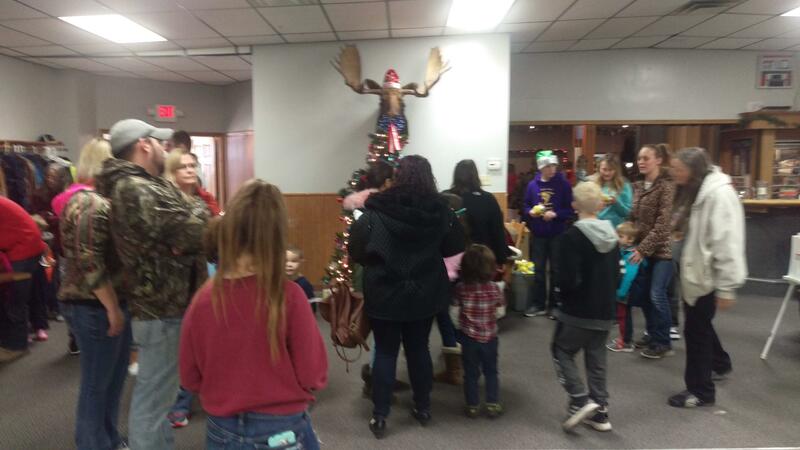 Kids, Cops, and Christmas is held annually by the Taylorville Police Department. Shelbyville schools has a new program called Baby Steps that has the administration plenty excited. Denise Bense is the Superintendent of Shelbyville schools, she says they felt like they needed to offer a program that would help parents with young children. Bense says once they got the grant they were ready to get the program going to try and make a difference in the community. Bense appeared as a guest on the Newstalk WTIM Morning Show live from our downtown Shelbyville studios. The city of Shelbyville is buzzing with excitement as there is a new exhibit that just opened on Main Street. Freddie Fry with the Shelby County Tourism Office says they got the exhibit set up for the first time last Wednesday. According to Fry there is a lot going on with this exhibit with there being 6 different components they had to set up. 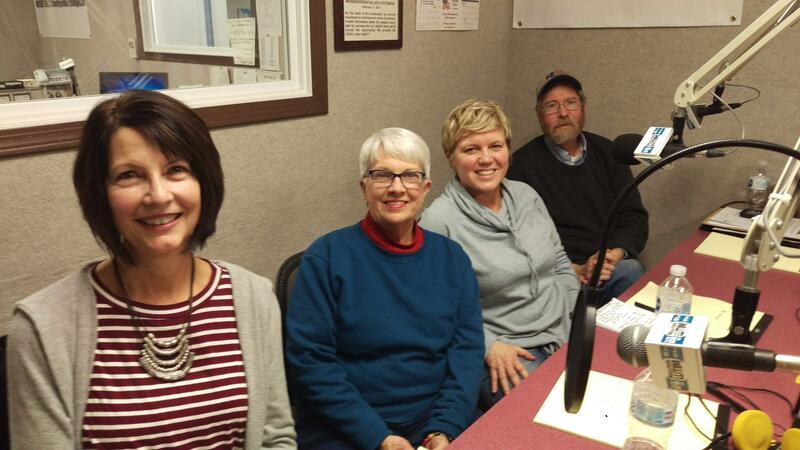 The second in the series of special programs called "A Season of Hope" with information on recovery and relief efforts after the December First tornado hit Taylorville, was heard on Friday on all 6 Miller Media Group radio stations. The program featured 3 guests in this week's installment. 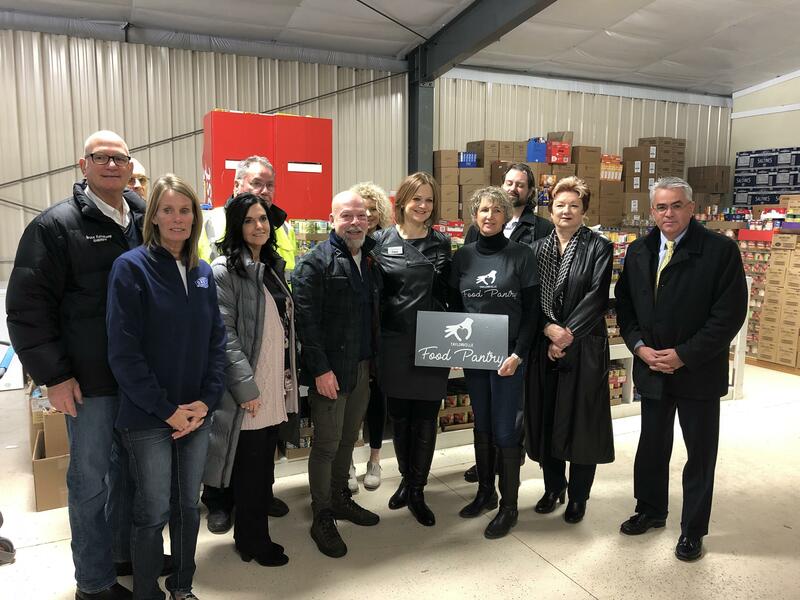 The first was co-executive director of the Taylorville Food Pantry Amy Hagen, who said she and co-executive director Pam Moses were listening to the coverage on the Miller Media Group stations the night the tornado hit, and they quickly made the decision to open the Food Pantry the next day. The 2nd was co-executive director of the Food Pantry Pam Moses, who shared that she expects the need for food to those affected, for months to come. The third guest on Friday's special tornado recovery program was Jody Rusher, outreach coordinator for the local C-E-F-S Economic Opportunity office in Taylorville, that is now the central location to direct people to relief agencies or for volunteers to call to help. Rusher shared why the county asked them to be the go-to agency and phone number for those affected by the tornado, as well as volunteers wanting to help, to call. The program can be heard in its entirety, on the "Tornado Recovery Assistance" page of taylorvilledailynews-dot-com. The third and final installment of the program "A Season of Hope" will be presented on the 6 Miller Media Group radio stations next Friday, December 21st from 3 to 4 in the afternoon. An owner of 2 radio stations in Maryville, Missouri, asked his high school football team to collect toys for the children in Taylorville, Illinois, and Friday afternoon he pulled that trailer over 5 hours to deliver them to the Taylorville head football coach. 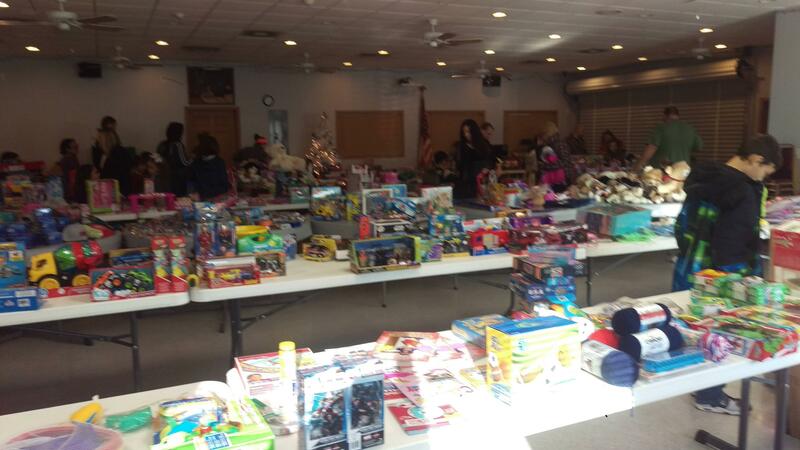 Jim Cronin is owner of 2 radio stations in Maryville, and told Regional Radio News how he filled the trailer with toys for Taylorville. 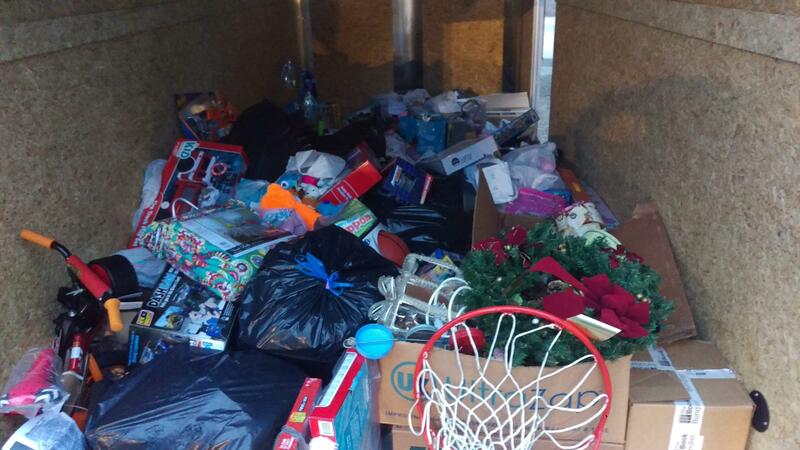 Cronin decided to ask his listeners to donate toys for Taylorville, Illinois, after hearing about the tornado. Cronin and Miller Media Group owner Randal J. Miller, are both members of the International Broadcasters Idea Bank, a group of 100 broadcasters in mainly small markets in the United States, Canada, Australia, and New Zealand. The group holds twice-a-year conventions in member towns, plus share an every other month newsletter. Taylorville High School football coach Jeb Odam accepted the toys on behalf of the T-H-S football team, and told Regional Radio News the toys will be donated to an organization that's involved with local toy distribution for children during the Christmas season. A catastrophic EF-3 tornado that hit Taylorville knocked down trees, and tore a part a lot of residents landscaping. The Christian County Master Gardeners are looking to help residents, and teach them how they can get their landscaping back to what it was before. Local master gardener Gwen Podeschi says they were at the MARC last weekend to help answer questions. Podeschi says they are going to hold a program in April about replacing trees. If residents want to reach out to the Master Gardeners, Podeschi shares how. Podeschi, and all of the local master gardeners are happy to provide landscaping advice to those who have damage from the tornado. Cleanup is still going on in the affected areas from the tornado at the beginning of December, and debris needs to be thrown away in the correct places. 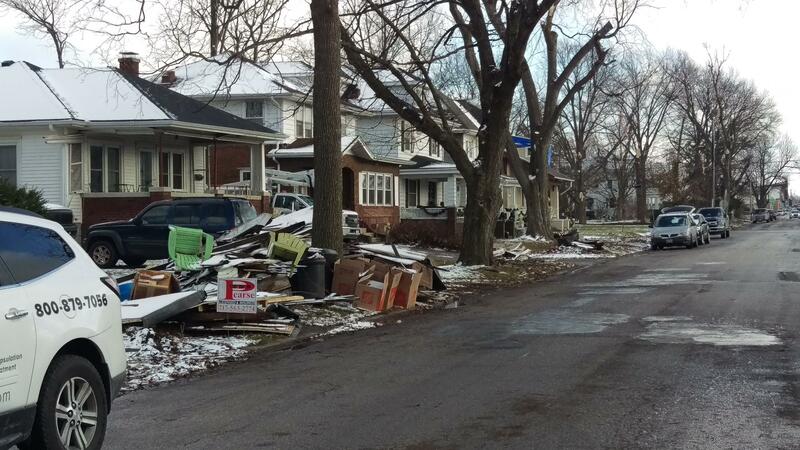 Mayor Bruce Barry says there will be dumpsters available at the street department. 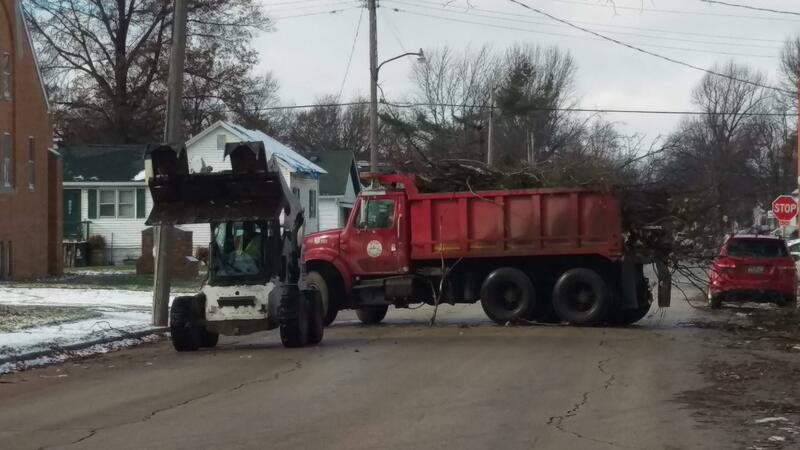 The city is always willing to take debris such as tree limbs. Barry also says that volunteers are welcome to come help unload trucks at the street department, and he will provide lunch. Volunteers are welcome to come out and help Saturday beginning in the morning at 9. 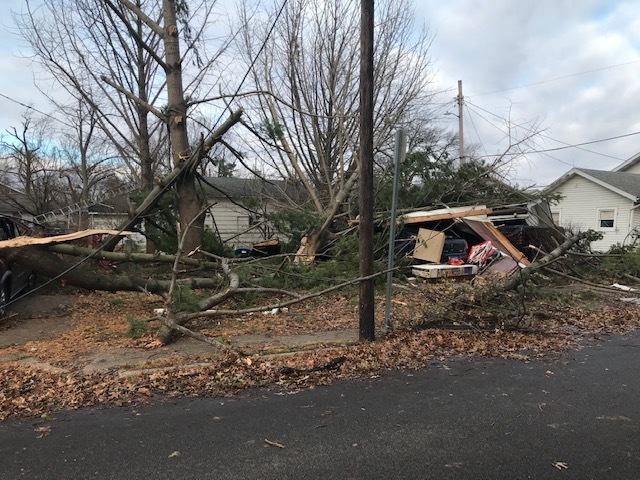 The Lutheran Early Response Team (LERT) has been assisting in the relief efforts after the December 1st tornado in Taylorville. Pastor Rodney Blomquist shares some of what LERT was able to after the storm. LERT also accepted volunteer help, and they received help from not just residents, but people outside of the community. For instance, the Millikan Baseball team volunteered. Blomquist says that the volunteer help made a positive impact on the recovery efforts. State Senator Andy Manar represents the 48th District of Illinois he was in Taylorville less than 48 hours after the tornado went through the city. Manar says his heart is warmed when he sees the response the Taylorville community has had to the Tornado, he has heard from others how strong this community has been. Taylorville residents are still dealing with the damage the EF3 tornado did to the city on December 1st. Rob O’Brian is the President of O’Brian and Associates located in Joplin Missouri. He knows what Taylorville residents are feeling as in May of 2011 Joplin was hit by and EF5 tornado. O’Brian says the first step is always the hardest in the recovery process and acknowledges that when a natural disaster like this happens there is so much to do in the aftermath. O’Brian says there were a lot of questions after the EF5 tornado went through Joplin in terms of when things would go back to normal. O’Brian appeared as a guest on the Newstalk WTIM Morning Show. Patty Hornbukle is the CEO of the Greater Taylorville Chamber of Commerce, she has seen in the two weeks since the tornado came through our city a community that has rallied together. Hornbuckle knows that there are still residents that need help and those that want to help any anyway they can, she shares how residents can do just that. Hornbuckle knows that there are residents in town that are looking for some normalcy, she is trying to do just that even if it is just for a day. Hornbuckle and the Chamber of Commerce will be at the fire department Saturday morning at 9 with T-shirts and sweatshirts. For those who are interested in collecting donations, or making a donation at the Gagne Building, there are new hours. Beginning December 13th, the Gagne building is open from 8 in the morning to 4 in the afternoon through December 16th. Hours change from 10 in the morning to 4 in the afternoon on December 17th through December 21st. They are not asking for clothing donations at this time. 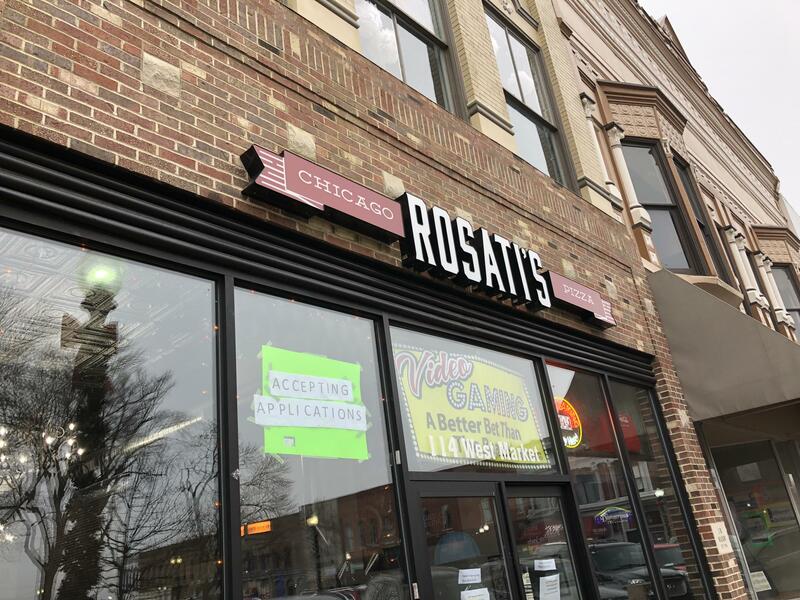 Rosati’s Pizza on the Taylorville square is opening its doors Monday, December 17th. Owner Peggy Brandon is looking forward to opening day and reflects on everything leading up to the opening. To make sure that Rosati’s is prepared for the first day of business, corporate helped out by teaching the necessary skills. Brandon hopes Rosati’s can become a large part of the Taylorville community, and she looks forward to serving her customers. CNB Bank and Trust donated $300 towards the Taylorville Police Department’s Kids, Cops, and Christmas. Taylorville Police Chief Brian Hile on the generous donation. The goal of Kids, Cops, and Christmas is to help kids in the community who may not get the chance to celebrate Christmas like most others. Kids, Cops, and Christmas is Thursday starting at 5. The Christian County Problem-Solving Court Graduation is this Friday at Davis Memorial Christian Church. Ann Wolfe, Supervisor of the probation department, says 5 people are going to graduate this time around. Wolfe says this graduation is a huge milestone for former addicts as they continue to recover. The ceremony will begin at 1 in the afternoon on Friday. Being the Mayor of the biggest city in Moultrie County would be a stressful job for anyone to handle. Ann Short has that job title at the moment and is enjoying her time in office. Short says first things first she is the Mayor of Sullivan, but does admit that her duties are vast as she is the head of multiple departments. The City of Sullivan has a commission form of government, Short says these forms of government are dying off, but it works for the City of Sullivan. Short appeared as a guest on the Newstalk WTIM Morning Show live from the downtown Metro Communications Building in Sullivan. Taylorville Community Credit Union is making a generous donation of $10,000 to Missions for Taylorville. TCCU CEO Will Perkins says they are happy to help the community. Perkins compares the donation with neighbor helping neighbor. Perkins was thankful for the response that he saw from the community after the tornado, and was happy to help. Taylorville Food Bank has been busy after they were full from donations last week. Amy Hagen from the food pantry says they have been hard at work since December 2nd, the day after the tornado struck Taylorville. After the tornado hit, residents from all over the community have found ways to help, and Hagen shares her thoughts on what she has seen come through the food pantry. The Food Pantry also received a large donation from Nuehoff Media of $50,000 was a complete surprise to Hagen. The Taylorville Kiwanis Club donated some 177-dollars from its weekly "Happy Bucks" promotion, to the Missions for Taylorville tornado relief program, during its Tuesday luncheon. The "Happy Bucks" promotion is a former Post Office Box converted into a piggy-bank type container, and Kiwanis members normally donate a dollar or 5-dollars when they have something happy to share with the club. Kiwanis president Michael Evanchak tells Regional Radio News how the donation happened. On Wednesday, Evanchak donated a check from the club for $177, to the Missions for Taylorville tornado relief effort, on Wednesday. 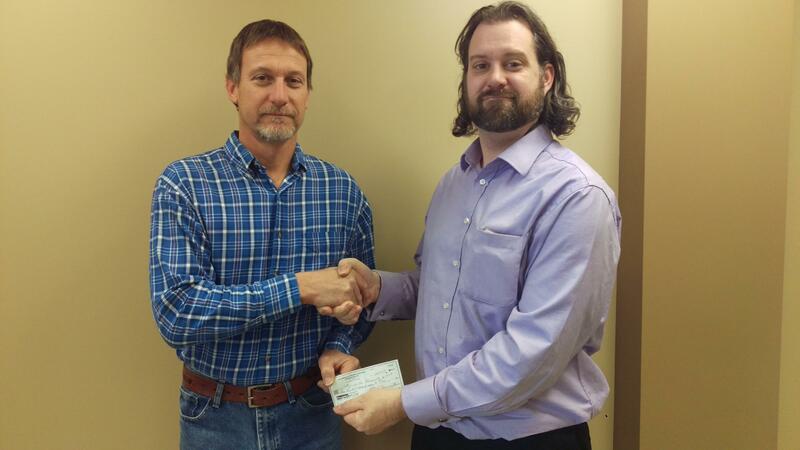 Accepting the check on behalf of Missions for Taylorville was its director Ed Legg. Friday and Saturday last week, a Multi-Agency Resource Center (MARC) was set up to help assist residents who suffered from the December 1st tornado. Maria Henneberry of the Red Cross shares that they were able to help over 100 residents. Not only did the MARC assist with victims, but also with volunteers. They were able to use their resources to learn where volunteers could be used best. Henneberry says that having the 22 different agencies on hand made a huge impact. The MARC was open at Taylorville Christian Church last Friday and Saturday. People’s Bank and Trust is wanting to help residents who were affected by the December 1st tornado, and CEO John Gardner is going to provide zero percent interest loans to those needing short term support. Gardner says initially they are going to offer this until the end of December. 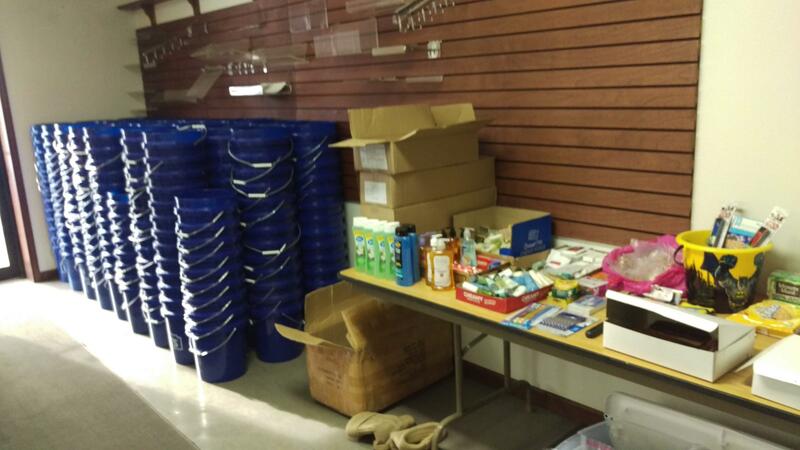 People’s Bank and Trust is happy to help those in need who suffered damage from the tornado. 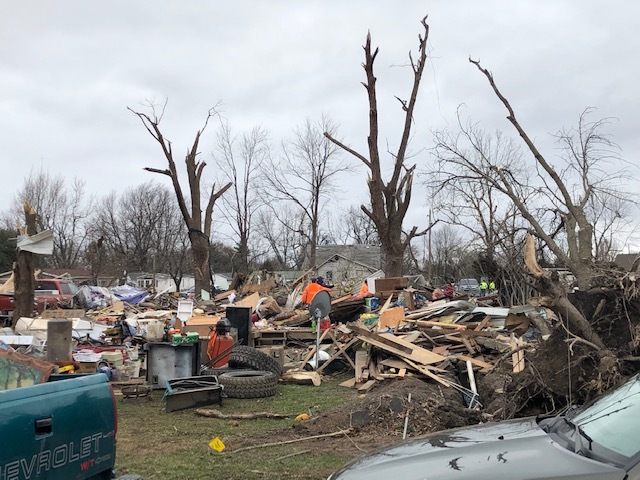 Illinois Southern Baptist Disaster Relief has been helping Taylorville recover after a catostrophic tornado damaged hundreds of homes. Dennis Felix, commander on sight in Taylorville shares how much they were able to help. Felix, and other members of the relief team were on sight shortly after the tornado hit. Felix says that when looking at how Taylorville has recovered, this is a strong community. Felix also mentions that they have been busy all summer helping other communities rebuild from natural disasters. Before they came to Taylorville, they were assisting with hurricane Michael in Florida. Just because the temperatures are heading south for the winter and winter months are upon us does not mean the Christian County Senior Citizens Center is taking a break in the action. Gerry Mahr with the Senior Citizens Center says there are still a couple of trips left this month that have vacancies. The Cross Country Classics always bring a big crowd when the visit Taylorville. They are back December 16th to do their Christmas Show and Mahr says the Senior Citizens Center will be driving residents over to the event that day. On the first day of December at 5:20 in the evening an EF3 tornado made its way through Taylorville. Superintendent of Taylorville Schools Dr. Gregg Fuerstenau made the decision to close school on Monday to make sure the building was safe for students to return. Fuerstenau says the Taylorville School District is fortunate to have received minimal damage from the storm. Fuerstenau is proud to be a Taylorville resident saying how impressed he is with how quickly and with what great strength this community rallied together. 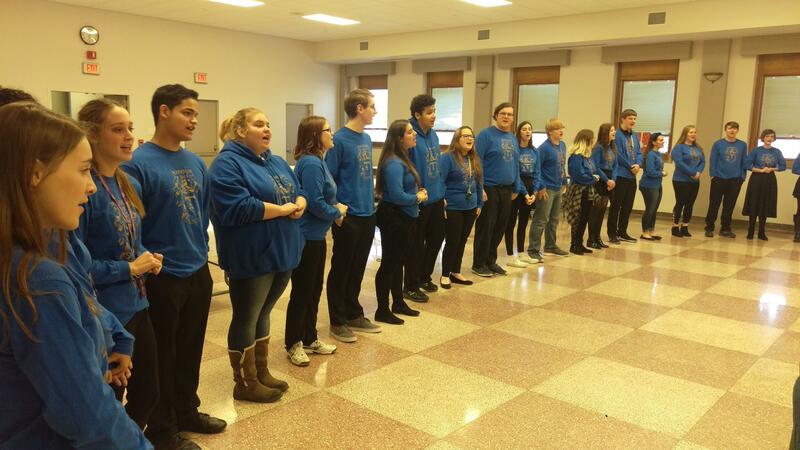 The Taylorville Kiwanis Club were entertained by over 20 members of the Taylorville High School Madrigal Singers, during their weekly luncheon Tuesday. T-H-S music teacher Keith Chase led the singers in several selections that were part of their Madrigal Dinners last weekend at the high school. Several guests attended the Madrigal Singers presentation, including Taylorville mayor Bruce Barry, police chief Brian Hile, and Taylorville High School principal Matt Hutchison. Taylorville Fire Department was called in to assist with a house fire on 2041 North 1300 East Road between Taylorville and Mt. Auburn Monday morning. Taylorville Assistant Fire Chief Andy Goodall on what the scenario was for the two story house fire. Goodall says that the cause of the fire is still being investigated. However another hazard was thick fog which caused a pedestrian accident. There were no injuries reported from the fire, or the accident. Missions for Taylorville has released its tornado repair application form, for those who were affected by the December First tornado, to complete. If you own a building that was damaged by the tornado, and would like assistance from the Missions for Taylorville program to help with repairs, please download the application which can be found on the "Tornado Recovery Assistance" page on taylorvilledailynews.com. There is an icon there to click on to bring up the application in PDF format. It's also available on the Missions for Taylorville Facebook page, and also on the missionsfortaylorville-dot-org web site. 1500 West Franklin, Taylorville, during church office business hours Monday thru Thursday 8am-noon and 1pm-3:30pm, or Fridays 8am-noon. Help has been coming to Taylorville from all over ever since the December 1st tornado that damaged over 600 homes, even from outside of the state. Jim Cronin, owner of KNIM AM-FM in Maryville, Missouri, has found a way he can contribute. The local high school football team in Maryville is going to donate toys in honor of Christmas. Cronin says this is not the first time his station has done something like this. 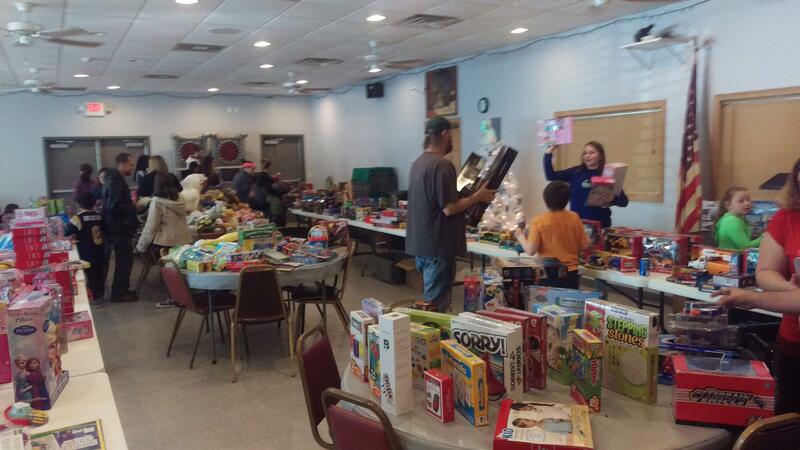 Cronin also mentions that the toys aren’t only for tornado victims, but to help give during the holiday season. Cronin will present the toys raised to the Taylorville High School football team this Friday, December 14th. After being delayed by a tornado, Taylorville’s Twilight Christmas Parade was held last Saturday, and it honored those involved in the catastrophic storm. Marcia Neal with Downtown Taylorville on the environment of the parade. Neal is very thankful that they were able to reschedule, and that everyone was able to enjoy the parade. Victims and emergency crews from the tornado were honored, and grand marshaled the parade. Taylorville is still dealing with the aftermath of the Tornado that ran through the city on December 1st. Responders have been second to none in the wake of this disaster and helping keep the peace in Taylorville. Amy Calvert Winans is the Christian County Coroner she has been out in the community seeing the damage the EF3 tornado did to the city. Winans says she has been at the EOC for a week and sees the blessing in the Christmas Parade being canceled and saving lives. She says in her mind it is a miracle that there were no fatalities not just from the tornado but also from responders out clearing debris. Winans appeared as a guest on the Newstalk WTIM Morning Show. Monday night, the Taylorville School Board met to discuss items involving the Taylorville School District. After recognizing Illinois scholars the treasurer’s report was given by Dr. Gregg Furstenau, and the board passed the report unanimously. Shortly after that, the new school board member, Dr. Ronald Mizer, was sworn in to his new position. The board then moved on to new business which first discussed the consideration of an Ameren Gas Station Easement which cleared unanimously. Next, Furstenau walked the board through the Junior High window replacement project. Windows at the Junior High are going to be replaced in July. Following that was the technology integration specialist presentation showing how new technologies have been introduced to all levels of the Taylorville School District such as virtual reality and z-space, and how it is being used in the classroom. Furstenau was impressed with what the presentation showed, and explains his thoughts. After the presentation was the superintendent report, and then the meeting adjourned. The Taylorville School Board meets on the second Monday of every month. You can watch the full School Board meeting here. 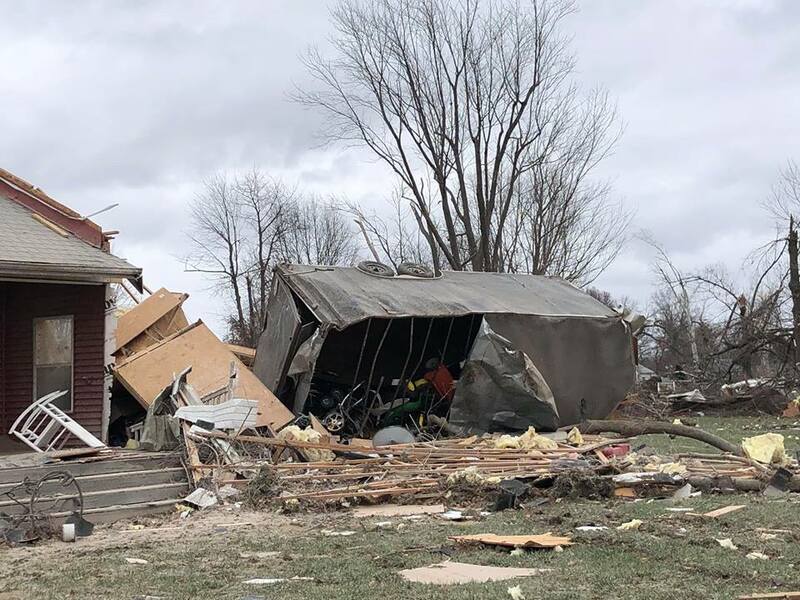 The National Weather Service in Lincoln over the weekend, revised their totals on the number of tornadoes that hit Illinois on December First, as well as revising the damage totals from the E-F-3 tornado that hit Taylorville that day. The Weather Service now says storm surveys and reports have indicated that 28 tornadoes occurred across the state, the largest December outbreak since 1957. The town of Taylorville, located southeast of Springfield in Christian County, was hardest hit. This particular supercell took a long path from the eastern fringes of the St. Louis metro area, to east of Bloomington. Other supercells tracked up the Illinois River valley in west central Illinois. The Weather Service revised the damage numbers from the tornado that hit Taylorville. They now say that Information from emergency management indicated 34 homes severely damaged/destroyed, 66 homes with major damage, and 406 homes damaged but inhabitable. They also said there were 22 injuries. The Weather Service EF-Scale ratings on the south side of Taylorville were EF-3, with estimated wind at 155 mph and a maximum width of 1/2 mile. They added the tornado that hit Taylorville, was on the ground for some 12-point-7 miles. 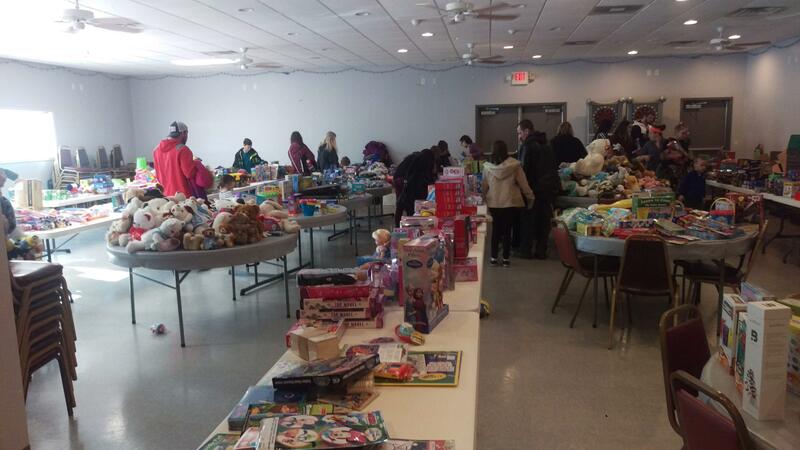 Many local businesses are stepping up to help in the recovery following the December First tornado in Taylorville. 2 of those examples are Landmark of Taylorville and Taylorville Home Source. Landmark of Taylorville is collecting donations for Missions for Taylorville, and is providing a match of up to 10-thousand dollars for monies they collect in December. 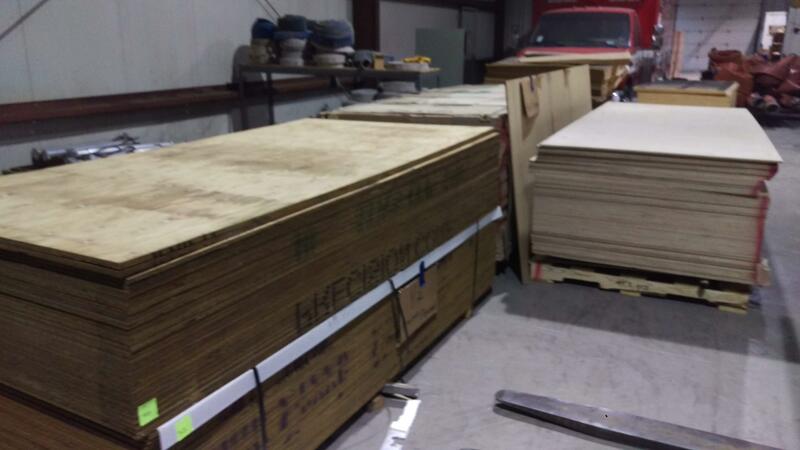 Taylorville Home Source has made special arrangements with one of their suppliers, Shaw Flooring, to offer those affected by the tornado, and the community at large, special pricing on in stock selected carpet, laminate, and vinyl flooring. The City of Taylorville is receiving a lot of supplies from various businesses thru-out Central Illinois, that they're providing those affected by the December First tornado. Taylorville City Aldermen and Employees, along with volunteers provided by CNB Bank and Trust, and others, are manning a relief center in the former Gagne Distributing building on West Spresser across from the Fairgrounds. 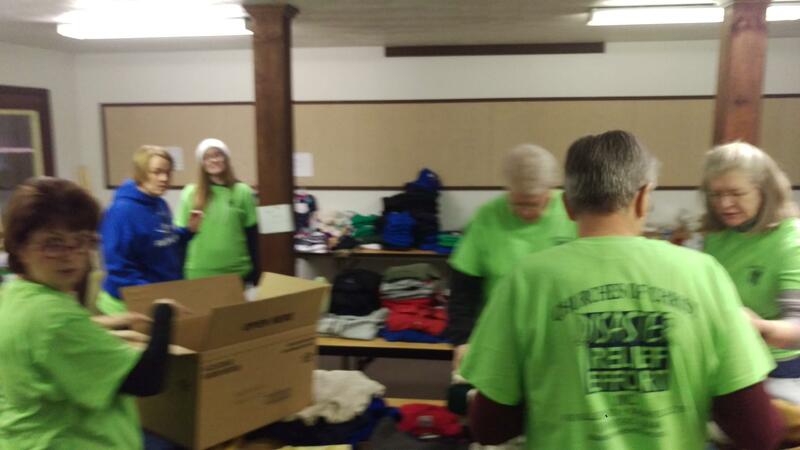 The National Churches of Christ Disaster Relief Center is also set up in the same building. Taylorville city alderman Earl Walters tells Regional Radio News that everything from cleaning supplies, brooms, bottled water, and even 4-by-8 sheets of plywood, have been donated and are available to provide those hit by the tornado, at no charge, by just coming to the former Gagne Distributing building on West Spesser. 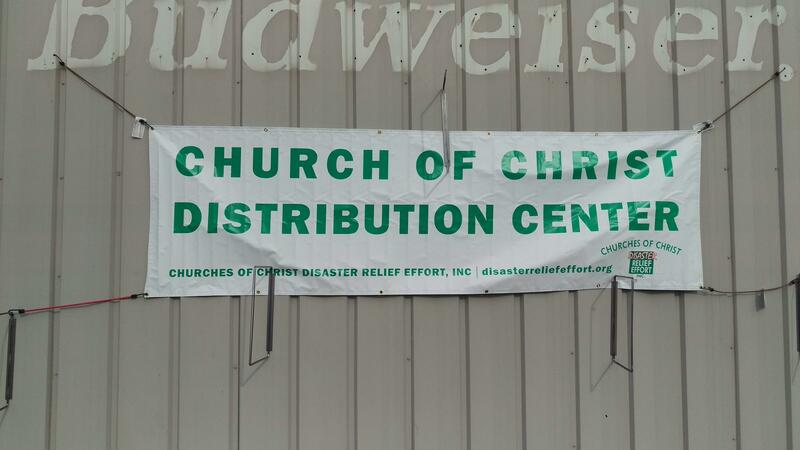 The Churches of Christ have established a distribution center for cleaning supplies, ready to eat meals, clothing, shoes and much more, in the former Gagne Distributing building now owned by the City of Taylorville, on West Spresser across from the Christian County Fairgrounds. 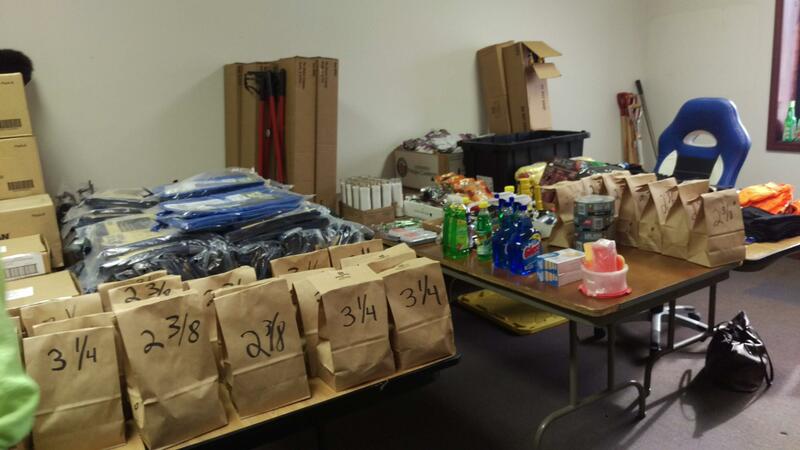 Roger Bolin, a member of Lakeside Church of Christ in Springfield, is helping the National Churches of Christ Disaster Relief effort, and told Regional Radio News all the supplies and efforts they are providing the Taylorville tornado disasters victims. Bolin said the national news coverage of the devasation after the Taylorville tornado, caught the attention of the Churches of Christ Disaster Relief office. Bolin said that many volunteers from his church are manning the distribution center in the former Gagne Distributing building. Again, the National Churches of Christ Disaster Relief Distribution Center is open 8 to 6 every day in the former Gagne Distributing building on West Spresser across from the Fairgrounds, and is providing clean up supplies, ready to eat meals, clothing and shoes, and other needed items that those in need can take advantage of. Volunteers from all around the community are coming together to help Taylorville recover from an EF-3 tornado that struck the community a week ago. Since Wednesday, over 125 volunteers have been making a difference, with many of those volunteers helping out every day. Scott McFarland, Executive Director for Serve Illinois, says there’s been over 700 hours logged. McFarland has been in constant communication with the MARC that has been set up at Taylorville Christian Church to understand the needs of the community. Most volunteers are being placed with organizations such as Rubicon that have been assisting Taylorville since last weekend. Volunteers will be accepted through the weekend, and next week. Team Rubicon has been one of many groups to help lead volunteer efforts in the aftermath of last Saturday’s tornado. Jeff Wagg is stationed with Rubicon at the Christian County YMCA, and his teams were on sight shortly after the tornado hit. Rubicon has also been able to incorporate volunteers into their work as well. 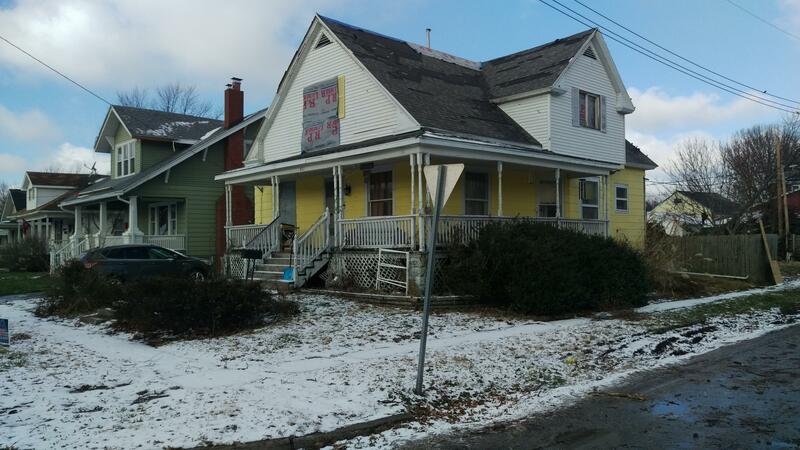 They have been welcoming those in Taylorville who want to help, and it has made a difference. Wagg is very thankful for what the YMCA has done, and their hospitality while Rubicon continues to clean up Taylorville. Rubicon continues to help, and assist Taylorville in the effort to clean what the tornado left behind. The firearm deer hunting season drew to a close December 2nd, and just over 80,000 total deer were harvested in Illinois. The preliminary harvest for the first segment of firearm season was around 58,000, but Ed Cross of the IDNR says numbers were down in the second segment due to weather. The exact number of deer harvested was 80,896, about 700 more than 2017. Remaining deer hunting seasons in Illinois are the Muzzleloader only season now through December 9th, archery season through January 20th, and in some counties antlerless only season December 27-30th, and January 18-20th. 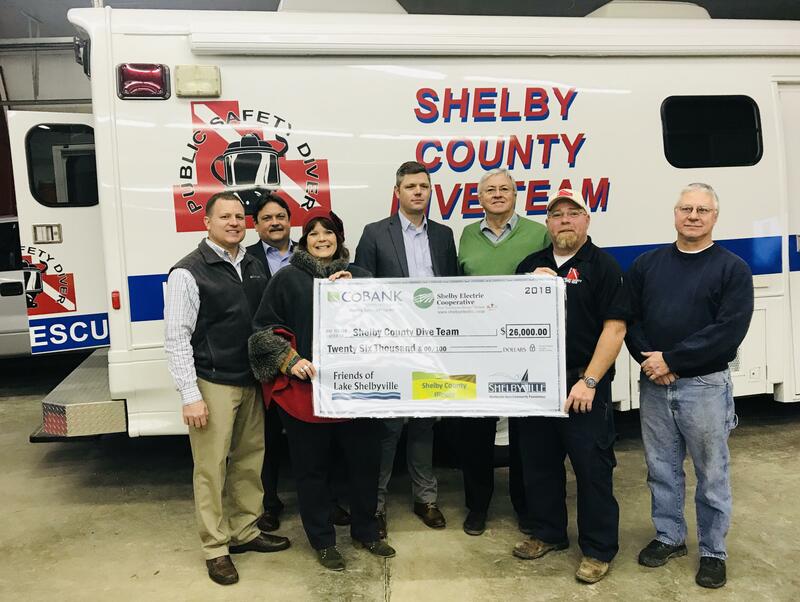 Thursday morning, Shelby Electric Cooperative with a matching grant from CoBank donated $26,000 to the Shelby County Dive Team. After responding to a rescue at Kaskaskia river last summer, one of their vehicles blew an engine. The $26,000 will go toward the cost of a new vehicle. Shelby county board member Dave Cruitt on why there is a need for the new vehicle. Aaron Johnson with CoBank explains why they got involved despite being from Denver. Austin Prichard of the Shelby County Dive Team explains how much the donation means to him and his team. First National Bank in Taylorville is going to donate $5,000 to Missions for Taylorville after deciding to join in on the effort to help repair damage from the tornado that hit Taylorville. Jared Beckham of First National Bank explains more, and how residents can get involved. For those who would like to donate, just stop by both locations to make a donation. Hear Podcast of Miller Media Group Special "A Season of Hope: Faith, Family, and Friends"
The 6 Miller Media Group radio stations simulcast the first in a series of programs called "A Season of Hope" on Friday afternoon, December 7. The program featured Pastor Michael Evanchak, president of the Taylorville Ministerial Association which oversees the Taylorville Food Pantry; and Pastor Bill Kerns of the Mission for Taylorville committee. The program will continue on Friday afternoons from 3pm to 4pm, on all 6 Miller Media Group radio stations, thru-out December. The 6 Miller Media Group radio stations in Taylorville, will continue its series called "A Season of Hope" on the continuing efforts towards recovery after the December First tornado. The program, which will feature representatives from the Taylorville Ministerial Association and Missions for Taylorville, will air from 3 til 4 in the afternoon, on Fridays thru the rest of December. The program will encourage people to call and share how they've seen people help people, how they themselves have been helped since the tornado, or if they are in need of help due to the disaster. The first program aired this past Friday, December 7th. The series can be heard live on NEWSTALK WTIM THE BIG 870 across Central Illinois, 96.1 FM in Christian County, streamed at taylorvilledailynews.com and on the WTIM mobile app; WMKR 94.3 FM; WRAN 97.3 FM; WSVZ 98.3 FM; NEW Country 104.1; and Easy Hits 96.5. The 6 Miller Media Group radio stations simulcast a one hour special called “A Season of Hope: Faith, Family and Friends” on Friday afternoon. 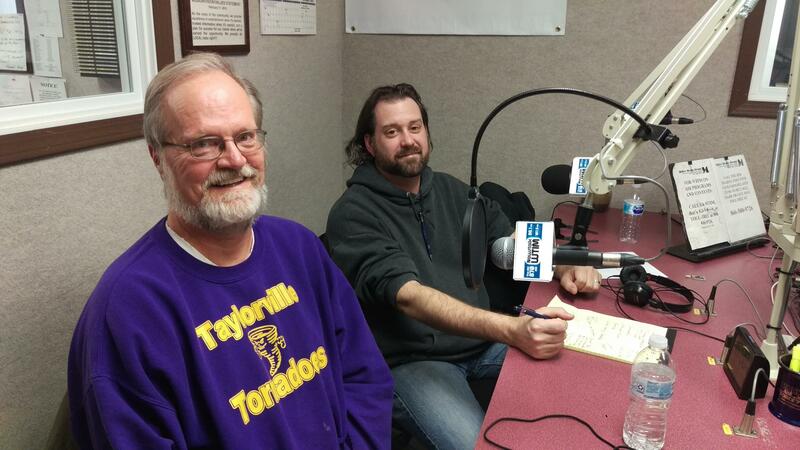 The program featured Pastor Michael Evanchak, president of the Taylorville Ministerial Association that oversees the Taylorville Food Pantry; and Pastor Bill Kerns, who is with the Missions for Taylorville program. The program was meant to encourage the Taylorville community after the devasating tornado that hit the city last Saturday, leaving some 300 structures damaged, 30 homes destroyed, and 30 people injured. Pastor Evanchak told listeners about how the Taylorville Food Pantry, located at 1429 East Main Cross, has been assisting those in need, before and during the tornado disaster. Pastor Kerns told listeners the Missions for Taylorville committee is working out details to accept applications to help those whose homes have been damaged. Pastor Kerns added that Missions for Taylorville now has a way to give to their non-profit organization directly, on-line. You can find that link on the “Tornado Recovery Assistance” page on taylorvilledailynews.com. The MARC being set up at Taylorville Christian Church for residents affected by last weekend's tornado opened Friday morning. Over twenty agencies have been made available to help those in need who may have suffered damage to their homes or worse. Regional Communications Director for the American Red Cross Maria Henneberry describes the environment as an act of love. The goal of the MARC is to try and cover every persons need that they can. That even includes child care services. The MARC opened at 11 in the morning Friday, and a steady flow of people have been coming in for help. Henneberry believes that will continue as long as the MARC is open. The MARC is open until 7 in the evening on Friday, and will be open for one more day on Saturday from 8 in the morning till 1 in the afternoon. Our thanks to Kevin for sharing this video with our taylorvilledailynews.com readers. The Twilight Christmas Parade at the Taylorville Square was scheduled for last Saturday, but was canceled last minute with a tornado on its way to Taylorville. Marcia Neal with down town Taylorville could not have been more thankful for the action taken by Taylorville Fire Chief Mike Crews. The Twilight Parade has now been reschedule to this Saturday, December 8th, and it is going to pay a special tribute. Neal adds that it is a great opportunity to return to some normalcy. One Taylorville native who now lives in Chicago has found a way to make her donation to the Red Cross for Taylorville, double. Ramey Miller, one of the daughters of Miller Media Group owners Randy and Cathy Miller, was concerned about her hometown, and found out that her employer, Grainger, offers their employees matching dollars to qualified organizations, when an employee donates. Ramey said she’s planning on giving several times over the next several months so that her gifts are matched by her employer, because the recovery will take time. And, Ramey remembered the long-time Greater Taylorville slogan. Ramey reminds everyone to check with their employer to see if they have a matching gift program for their employees, so they can give to a non-profit organization that is helping Taylorville with recovery. In an effort to help families impacted by severe storms that swept through central and southern Illinois Saturday evening, the American Red Cross is joining with state agencies and community partners in Christian County to create a MARC, also known as a Multi-Agency Resource Center. The MARC is designed to assist those recovery from the impact of the storms. Gayle Lundeen of the American Red Cross is managing the MARC being set up in Christian County. As of Thursday, nearly 20 different agencies are going to be at the MARC to help provide assistance according to Scott Clark of the American Red Cross. Mobility manager with Centrall Illinois Public Transit, Nathan Nichols, would also like victims to know that they will be providing free transportation on Friday for the Red Cross. All vehicles are also handicap accessible. The MARC will be located at Taylorville Christian Church. It will open this Friday morning from 11 to 7 in the evening, and again on Saturday from 8 in the morning until 1. Regional Radio News has learned that the city of Nokomis had a water main break on Thursday. Due to the issue, the entire city of Nokomis will be under a boil order until further notice. Calvary Baptist Church in Taylorville is offering a free laundry service for tornado victims and relief workers, in conjunction with Car Wash City Landromat, today (Thurs) til 6:30pm, and Friday starting at approximately 10:30am. Bring your laundry to the Calvary Baptist gym either day. For more information, contact Patty at 565-0170. Vision Source in Taylorville is wanting to provide their services to residents affected by Saturday’s tornado. Dr. Rob Smith is offering free vision exams and glass to victims of the tornado. Those looking to take advantage of the offer must bring a photo I.D. as proof. Vision Source is located at 904 W Springfield Rd. 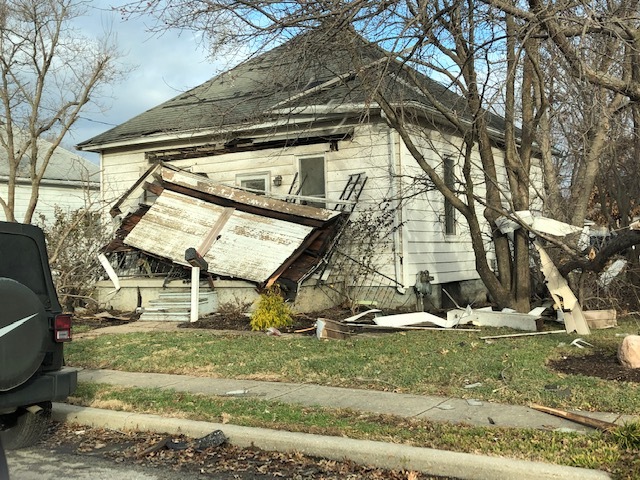 Mary Renner of the Christian County Economic Development Corporation (CCEDC) has been searching for ways to assist Taylorville’s recovery after an EF3 tornado hit the city. Renner says that she is looking into financial options. Renner is also looking into grants that could be applied for. As far was when the grant application process can begin, Renner says damage assesment factors into that, but it could be awhile. UIS athletics also wants to welcome Taylorville students and families to attend at no cost. UIS will also be hosting a silent auction with all proceeds going to Missions for Taylorville, and the Taylorville Food Pantry. Items at the auction will include team branded items such as shirts, hats, and uniforms. Tis the season to be jolly and the closer we get to the 25th it seems the more jolly residents seem to become. Laurrie Minor is in the Christmas spirit as she is looking forward to Old-fashioned Christmas in the downtown Sullivan area in the middle of December. New this year to the event is that lighting of the community Christmas tree. Minor encourages residents to stop by the Santa house. Minor appeared as a guest on the Newstalk WTIM Morning Show live from from the Metro Communications Building in Sullivan. The Moultrie County Relay for Life is an organization dedicated to fighting back against cancer in every event they host. Adam McReynolds is heavily involved in the Moutrie County Relay for Life. He says this year was a year of firsts for the organization. McReynolds couldn’t be prouder of everyone in the community and wants to thank everyone for their hard work, as none of this would be possible without them. McReynolds appeared as a guest on the Newstalk WTIM Morning Show live from from the Metro Communications Building in Sullivan. 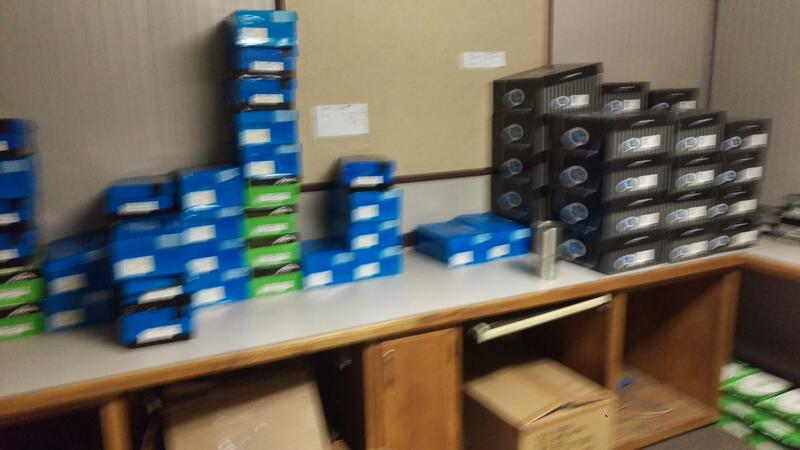 AT&T cell phone service was restored in Taylorville at 7:45 tonight, after an outage that lasted over 2 hours. The outage began around 5:30 tonight for Taylorville AT&T customers, and was limited to Taylorville according to the web site downdetector.com. Regional Radio News has learned that A-T-and-T cell service in the Taylorville area went out at about 5:30 tonight, and as of 6:40 was still not working. According to the web site downdetector-dot-com, Taylorville was the only community in the area affected. And, the Miller Media Group business lines also went out during the 5 o'clock hour tonight. This service is provided by New Wave Communications, and it's not known if it's part of a larger phone outage for New Wave, or just an individual case. Phone calls to the Miller Media Group should be made to 824-9846, which is the WTIM on air line, until the business line service is restored. The city of Taylorville has had 2 reports of scams during the rebuild process after an EF3 Tornado touched down December 1st. Mayor Bruce Barry wants residents to please be aware of false contractors who are trying to take advantage of victims, and to only use a contractor that is familiar to you. It is also important to note that legitimate contractors will not ask for any form of pay up front. Landmark of Taylorville is joining the efforts to help collect monies for the Missions for Taylorville program, which is helping residents with repairing their homes after last Saturday's tornado. Landmark General Manager Jason Johnson says the dealership is collecting money, and is matching all collections received in December. Johnson added their dealership also suffered damage from the storm. Johnson added that customers can get deep discounts on the hail damaged vehicles, which are available on a first-come, first-serve basis. The Miller Media Group has established a "Tornado Recovery Assistance" page on taylorvilledailynews-dot-com where all the current assistance being provided by the many agencies and local businesses, are listed. The icon is just below the masthead on every page of the on-line daily newspaper. 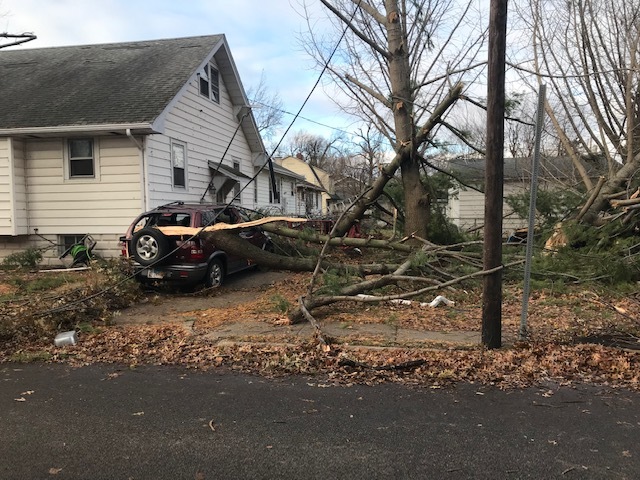 It will be constantly updated to include the latest information on where residents who suffered losses from the December First tornado, can get assistance. Non-profit agencies or local businesses, that wish to provide free assistance to those affected, can have their information listed by calling Katie at the Miller Media Group at 824-3395. The repairs and cleanup in Taylorville after Saturday's tornado continues. Below are pictures from the Franklin Street, Market Street, and West Main Cross areas of the city. 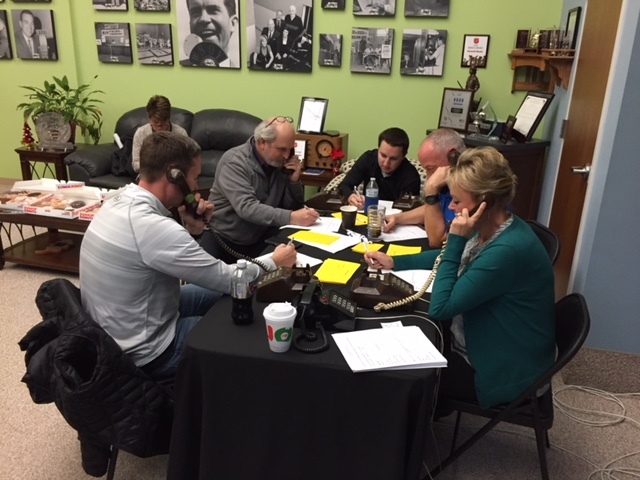 After hosting a 3 hour pledge drive Tuesday morning, Neuhoff Media’s WSOY in Decatur raised $50,000 for the Taylorville Food Pantry in relief of the tornado that recently struck the community. WSOY Morning Talk Show Host, Bryan Byers, says the idea came from their listeners. The original goal was to raise $20,000, but it did not take Byers long to figure out they would raise much more than the intended amount. Chief Operating Officer of Neuhoff Media, Mike Hulvey, describes the generosity as heart warming. WSOY may be in Decatur, but Hulvey describes it as neighbor helping neighbor, and that the response is what most local radio stations do in times like these. The check was presented Wednesday morning at the Taylorville Food Pantry. After this weekends storms IEMA teams are assessing damage to public infrastructure in central Illinois. Congressman Rodney Davis recently helped pass the Disaster Declaration Improvement Act to help the state receive federal monies to assist communities. Davis said the recent tornado outbreak could be the first test of this new law. 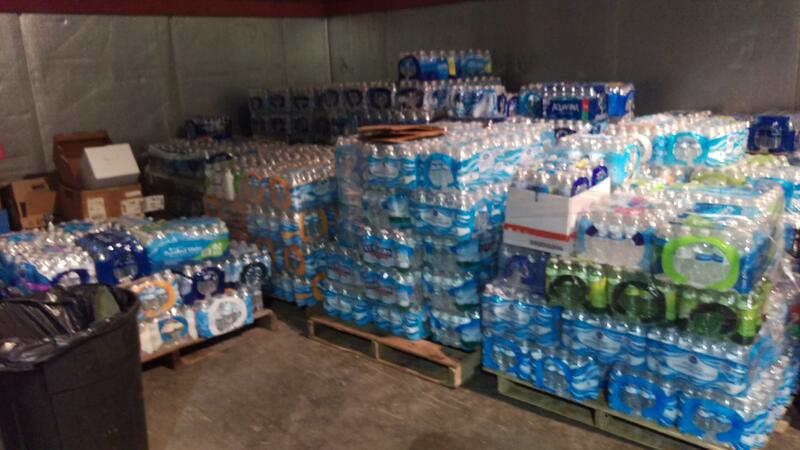 Help is pouring in for tornado relief from the surrounding areas and even as far as Tennessee and Kentucky. Ashley Earnest with Central Illinois Food Bank says this is a very difficult time for all of Central Illinois as over 20 tornadoes swept through the state on Saturday. Earnest knows that there may be some out there wanting to help, but wondering how, she explains. Amy Hagen is with the Taylorville Food Pantry, she says this weekend they originally were only going to be open for about two hours. Folks kept showing up in need so the food pantry ended up being open 12 hours on Sunday. Hagen says their warehouse on Main Cross is getting full but there is still a place to donate in town. Earnest and Hagen appeared as guests on the Newstalk WTIM Morning Show. Rodney Davis represents the 13th Congressional District of Illinois in Washington. Recently he has been seeing his fellow Taylorville residents sort through rubble and try to fight to get back to the Taylorville prior to the tornado. Davis knows it is tough to see the light at the end of the tunnel in times such as these, but does want to let residents know there has been an agreement reached on a new Farm Bill that will be very good for our farmers. Davis says it might have been done as earlier this week, but with the passing of George H.W. Bush a provision in law will not allow a vote to take place. 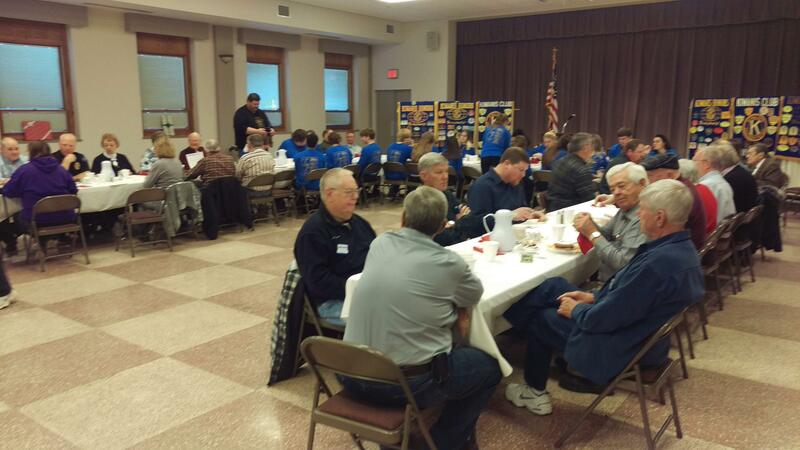 The Taylorville Kiwanis Club held their monthly business meeting, during their weekly luncheon Tuesday. Committee chairs gave reports on how they are helping with the Kiwanis’ goal of helping children and youth in the Taylorville community. The recent Coats for Kids effort provided some 65 coats to local pre-schoolers. Kiwanis Priority One Committee chair Harriett Morrissey was assisted by Kiwanis members Dean Ray, Alex McClure, Tom Ford and Michael Evanchak. Builders and Key Club chairperson Will Perkins reported that the Taylorville High School Key Club will be enlisted to assist at January’s Taylorville Kiwanis Pancake and Sausage Day at the Taylorville Moose Lodge. The 6 Miller Media Group radio stations based in Taylorville, will air a one-hour live show called "A Season of Hope: Faith, Family and Friends", this Friday afternoon from 3 til 4. Miller Media Group president Randal J. Miller will be joined live in-studio by Pastor Michael Evanchak, president of the Taylorville Ministerial Association which oversees the Taylorville Food Pantry; and Pastor Bill Kerns with the Missions for Taylorville program, talking about how faith, family, and friends are getting the Christian County community thru this crisis. From 3:40 til 4, the show will open up the phone lines asking for your stories on how people are helping other people during this difficult time. The program will air on all 6 Miller Media Group radio stations, which include NEWSTALK WTIM THE BIG 870 and 96.1 FM; WMKR 94.3 FM; WRAN 97.3 FM; WSVZ 98.3 FM, NEW Country 104.1 and Easy Hits 96.5. The program will also be heard on the WTIM live stream at taylorvilledailynews.com and on the WTIM mobile app. The Christian County Emergency Management Agency held their final press conference on the reliefe efforts after a tornado hit Taylorville Saturday evening. Perhaps the biggest update of the conference was the update on the plan for volunteers. Ever since the Tornado first hit, Taylorville residents have been asking how they can help. Taylorville Assistant Fire Chief Andy Goodall on the plan moving forward. Taylorville Mayor Bruce Barry also touched on the volunteer process, and thanked the school district. There have been no changes in the amount of homes that were damaged in the storm since Monday morning’s press conference. Also, all homes that are available to have their power restored have power according to the latest from Ameren. The city is still asking for monetary donations to be given to Missions for Taylorville at 115 North Main Street in Taylorville. The first Tuesday of the month of December was supposed to be a test of Taylorville’s emergency sirens. However, with the recent tornado that hit Taylorville, the test was not supposed to be activated, but a technology issue caused the sirens to ring. Taylorville Fire Chief Mike Crews explains the issue. Crews also reassures that everything is back to normal. The sounding of the sirens was just a monthly test, and there is nothing to worry about. The Neuhoff Media radio stations held a pledge drive this (Tues) morning both on air and on their digital platforms, raising over 50-thousand dollars for the Taylorville Food Pantry. The pledge drive was heard live on their newstalk station in Decatur, WSOY. Neuhoff Chief Operating Officer and general manager of their Decatur stations Mike Hulvey tells Regional Radio News about their efforts. Hulvey said the United Way of Macon County assisted in the fund raising efforts for the Taylorville Food Pantry. When the 3-hour live radio pledge drive was finished on WSOY Tuesday morning, over 50-thousand dollars was raised. Hulvey said their effort was an example of neighbor helping neighbor. That check presentation to the Taylorville Food Pantry is set for tomorrow (Wed) morning. Sunkist Cleaners in Taylorville is granting their services to those who were affected by the tornado that struck Taylorville until December 11th. Owner Bryan Payne says they are going to offer free services to those affected. Payne also mentions that he knows Taylorville will come back stronger from the Tornado. Manners Park in Taylorville has reopened. However, only those with Christmas in the Park displays are allowed to enter while the clean up continues. Recovering from the tornado is the first thing on everyone's mind including the City Council for Taylorville. Everyone on the council took the time to thank residents of Taylorville for all they have done since Saturday in terms of coming together as a community and helping to start the healing process. Mayor Barry does want the public to be aware that free legal advice will be provided to senior citizens, and those interested need to contact Skip Depaepe (DEE-PAP) at 824-2104. The Taylorville City Council meets on the first Monday of every month at the Municipal Building. While the tornado that came through Taylorville on Saturday is still fresh in residents minds the recovery process has began. Manners Park was closed on Monday as well due to damage caused from the storm. Bailey Hancock is in charge of Christmas in the Park and has been for nearly the last decade, she says that the park receiving damage has been a set back their plans for the event. Hancock says like everyone else they are hard at work trying to get everything back to normal, unfortunately they alread yhave to announce that they are canceling opening night on December 6th. Hancock appeared as a guest on the Newstalk WTIM morning show. Officials with the Taylorville American Legion Post 73 have notified Regional Radio News, that they would like to invite all members who suffered damages during the tornado to attend a meeting on Wednesday morning at 9. This includes American Legion Members, Auxiliary members as well as Sons of the Legion Members. The Taylorville Masonic Lodge is helping its lodge members, or spouses or children of lodge members, to recover from Saturday’s tornado. Brian McKinney is the Worshipful Master of the Taylorville Masonic Lodge, and tells Regional Radio News that the lodge is reaching out to help their members and families. McKinney says Taylorville Masonic Lodge members that have suffered financially from the tornado can either e-mail or call a special number set up to assist. And, McKinney again urged Taylorville Masonic Lodge members or their immediate family, to make contact either via the special e-mail or phone number set up, so that a meeting can be set up with them to find out how the Masonic Lodge can help them financially. Those involved in the command center responding to the outbreak of tornadoes in Christian County on Saturday, held their daily news briefing this (Mon) afternoon at Taylorville City Hall. The briefing was broadcast live on all 6 Miller Media Group radio stations. Senior meterologist James Auten (otten) from the National Weather Service in Lincoln, told the news briefing that as a result of surveying damage thru-out Christian County the last 2 days, Weather Service officials determined that 3 tornadoes his the county late Saturday afternoon. The first started in Montgomery County, and came into Christian County as an E-F-zero category tornado. The second one, which was the one causing the most damage, started near Morrisonville and came thru Taylorville, travelling some eleven-and-a-half miles. The third Christian County tornado started northeast of Taylorville, and traveled to Stonington as a category E-F-2, ending just across the Christian-Macon County line. Auten added the cells that created the 3 Christian County tornadoes, started in Montgomery County, and said the tornado that came thru Taylorville was the strongest one that’s hit the town since records have been kept at the Weather Service starting in 1950. Christian County Emergency Management Agency director Mike Crews, told the Monday news briefing, that the tornado aftermath is improving truckload by truckload. Crews expects a multi-agency resource center for those who lost their homes, to be open in a few days. Crews complimented Green Hyundai of Springfield for loaning cars to those who lost their vehicles in the Saturday tornado. Crews said the operations center will continue to work from 7am to 7pm. Taylorville mayor Bruce Barry told the Monday news briefing that the city’s preferred agency to donate money to, is the Missions for Taylorville organization, and that financial donations are welcome. Christian County Sheriff Bruce Kettelkamp told the Monday news briefing, that Ameren is having difficulty doing their work because of gawkers. Joe Gasparich, who is acting as the public information officer for the command center, announced that barring a weather event, Taylorville Schools will be open on Tuesday, and again asked the public to provide monetary donations and not clothing or food. In the daily written statement provided to the news media on Monday, law enforcement officials stated that Taylorville mayor Bruce Barry has signed a proclamation of disaster for the City of Taylorville, in effect from December First thru the 7th. The written statement also said Ameren expects to have those who still have homes but no power, to have their power restored by 6pm Monday. The written statement added that Crossroads Apostolic Church at 212 Jaycee Drive in Taylorville, is the designate shelter and remains open for those needing it. Finally, the written statement said that the command center has set up an official Facebook page entitled “Christian County Severe Weather and Disaster Recovery” for them to post further information to the public. Stay tuned to Regional Radio, as we’ll continue to carry the command center news briefings when they occur. According to Zach Crowley of Taylorville Christian Church, Convoy of Hope has provided Taylorville Christian Church with Garbage bags, plastic totes, cardboard boxes, rakes, brooms, protein cookies, and cleaning supplies. 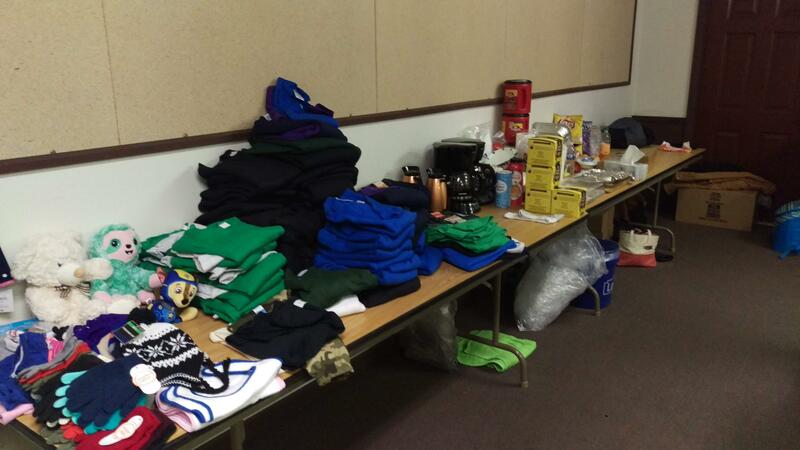 Taylorville Christian Church is encouraging those who have been affected by the tornado to stop by and get supplies. The Midland Division of The Salvation Army is located at the Christian County Fairgrounds. Beginning at 3 in the afternoon, they will be running a Point of Distribution also known as a POD. According to Emergency Disaster Services Operational Director, Martin Reuter, residents affected by the Tornado will be given cleanup kits, and items such as water, food, and soda. If you are looking to pick up a clean up kit, it is important to bring a photo identification to prove that you are in need. Currently, The Salvation Army is feeding those who are helping in the debree removal, as well as some volunteer groups. Until further notice, the WTIM business phone lines are down. If you are trying to contact the Miller Media Group Stations please contact 824-9846, or toll free at 866-500-9726. After a catastrophic tornado hit Taylorville, many residents want to know how they can help assist in the relief effort. Currently, the city is accepting monetary donations, but there is only one source working in conjunction with the city, and 100% of the funds will go toward the rebuilding effort. Ed Legg with Missions for Taylorville explains how residents can get involved. For those wishing to donate perishable foods, contact the Taylorville Food Pantry. It is also important to 100% of the funds donated to Missions for Taylorville will help assist the city in rebuilding efforts. The Illinois Department of Transportation on Sunday released drone video of the tornado devastation that hit Taylorville late Saturday afternoon. The video was obtained by Fletcher Ford of Regional Media in Kewanee; our thanks to him for providing it to us. Monday morning at 11, the Christian County Emergency Management Agency opened up a press conference on the latest efforts after a Tornado struck Taylorville Saturday night. Taylorville Fire Chief says today will mostly focus on donations management. Mayor Bruce Barry addressed the media as well. He mentions that the 9pm curfew is still going to be in affect until further notice. Barry also mentioned a lot of people he wanted to thank for trying to help the situation. As far as numbers are concerned, Ameren still has 313 customers without power. However, they expect all residences that can accept power to have it restored by 6 this evening. Damage assessment has reported that 506 total structures have been damaged, 34 have been destroyed, and 66 have major damage. Emergency crews are only asking for monetary donations at this time. For those who are interested in donating, go to the Missions for Taylorville site which is maintained through US Bank. Also, the official Facebook page for information about the response and recovery activities is Christian County Severe Weather and Disaster Recovery. The Red Cross is going to have cleanup kits for residents who have homes that were affected by the tornado on Saturday night. Ted Chapman with the Taylorville Fire Department on what the kits will include. Home owners will need a photo ID on hand, and they will need to go to the red cross shelter at the Cross Roades Apostolic Church. Cleanup kits are expected to be available later this morning. It’s been two days since a Tornado came through Taylorville causing damage to hundreds of homes in the city. Crews are still working hard to clean up the debris, and Mayor Bruce Barry is still has requests for residents of the city. Barry also mentions that they are not accepting food donations, but there are other sources accepting donations. The Shelby County Board takes it upon themselves to make sure that Shelby County is in the best possible shape it could be. Dave Cruitt is a Chairman of the Shelby County Board, he says there are 22 total members on the board to keep things running. Cruitt says it is always a little surprising to hear how many offices are in court house proper. Cruitt appeared as a guest on the Newstalk WTIM Morning Show live from our downtown Shelbyville Studios. For many high school students that are getting ready to graduate next spring they are starting to think about life after high school. For some select students from a variety of Shelby County schools they have been thinking about their post high school careers since summer break began by deciding to join the CEO Program. Beau Bennett has been enjoying his time in the CEO Program. Bennett says he has enjoyed speaking with some of the owners of local businesses and hearing the process of how they got to where they are today. The final project of the CEO Program is the CEO Trade Show. For this trade show each of the participants in the class will create their own business and present it to the public on a set date. Bennett already has a pretty good idea of what he will do. Bennett appeared as a guest on the Newstalk WTIM Morning Show live from our downtown Shelbyville Studios. Some love the rush of Black Friday and trying to get the best deals they possibly can, for others they much prefer to wait for Cyber Monday and have the Christmas presents delivered to their residence. Officer Alan Mills with the Taylorville Police Department says they get reports of packages being stolen year round, but around the holidays there is a spike in the amount of packages stolen. There have been reports of potential thieves following delivery trucks around to see what they can grab. Mills says he would recommend having your packages delivered to your place of work if the boss is okay with that. Mills appeared as a guest on the Newstalk WTIM Morning Show. When people hear Social Security they tend to think that it is exclusively for the elderly and their benefit. Public Affairs Specialist with the Social Security Administration Jack Myers says the fact that it is always associated with advanced age is just a stereotype. Myers explains how the process works if there is someone out there that needs help managing their Social Security. The Christian County Emergency Management Agency early this evening released the damage assessment report from Saturday's tornado in Taylorville. E-M-A says of the 301 total structures assessed, of those 53 recieved major damage, 29 were destroyed, and 219 were damaged but inhabitable which is 99% complete. Taylorville Police Department and Christian County Sheriff’s Office have implemented a 9:00 PM curfew for areas affected by the Tornado. Violators are subject to arrest or fines. There is also no burning allowed to get rid of debris. Food safety information is available from the Christian County Health Department. Ameren has reported that they are expecting all but 300 residnets to have power restored by midnight. At approximately 5:15 last evening the City of Taylorville and surrounding areas were impacted by tornadic winds. Many residences were impacted and people sustained injuries. If residents find that there is a power line down or if they suspect a gas leak, they should contact Christian County 911 immediately and they should not try to correct or mitigate the hazard on their own. The City of Taylorville was broken down into two geographical areas that were being checked throughout the night for people that may be trapped in residences and any secondary hazards such as downed power lines or gas leaks. Residents will be given information later on what to do with their debris in a later press briefing. Citizens may begin clearing debris if they are physically capable of doing so. Debris should be segregated into woody debris and construction and demolition debris. The woody debris will be collected first and it should be moved to curbside so responders can begin the process of removing debris. Residents should be cautions of contractors that offer services for debris removal or home clean-up and restoration. The contractor must be approved through the City of Taylorville before they will be allowed to work in the effected areas. If residents are without power and they can seek temporary shelter with relatives or friends they are encouraged to do so. Residents will be given information on what to do with their debris in a later press briefing. Ameren resources are reporting several downed power poles in the Taylorville area that have been destroyed and they are mobilizing resources to begin restoration efforts. Taylorville Memorial Hospital reported that 21 patients were treated for storm related injuries. 3 patients were transferred to other hospitals and one of the patients was critically injured. All of Taylorville Public Schools will be closed on Monday due to storm damage as will Visionway Schools. Please stay tuned to the Miller Media Group radio stations and on-line at taylorvilledailynews.com for continued coverage of the tornado aftermath. Some 40 pictures taken by Fletcher Ford for the Miller Media Group, have been posted to the taylorvilledailynews.com Facebook page. Many thanks to Fletcher, the radio son of Miller Media Group president Randal J. Miller, for making a late night trip from the Quad Cities, to Taylorville to assist the Miller Media Group staff in covering the destruction of Saturday's tornado. With parts of Taylorville without power the first question on residnets minds is when will it be restored. Kelly Hendrickson with Ameren says there is still a good number of homes without power and Ameren is working their hardest to get the power back on. Hendrickson says that they are being slowed down with debris and while she does not have the exact time power should be restored she says check the outage map online at amerenillinois.com. Power lines have been reported down, Hendrickson says exercise caution when clearing debris as there could be down power lines hidden. The Tornado that tore through central Illinois last night really took a tole on residents throughout Christian County. Rodney Davis of Taylorville says this is personal to him, as the Congressional representative for the 13th district of Illinois he has seen the surrounding areas deal with tornadoes, this is the first one to hit his home town of Taylorville. Davis encourages residents to go to the Christian Country Severe Weather and Disaster Facebook page for help if it is needed, or call 825-8846 or 824-2295. Davis says the damage is terrible but he is asking residents to stay away from going out for a drive to look at all the damage as the emergency crews need to get through. 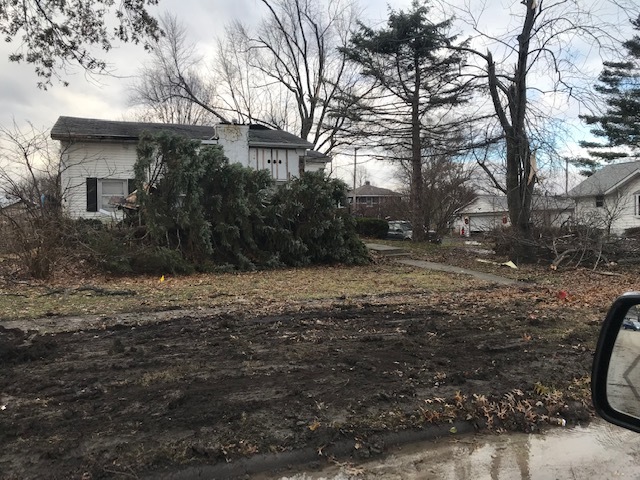 With Taylorville dealing with the aftermath of the Tornado Chris Miller with the National Weather Service says crews are out assessing the damage done by what the National Weather Service reported as a catastrophic tornado. Miller says it is rare to have tornadoes this late in the year, although it is not unheard of in surrounding counties this is the first tornado on record for Christian County in December. Miller says more for up to the minute information head to weather.gov/lincoln. The American Red Cross has set up a shelter for those displaced by the tornado that hit Taylorville Saturday afternoon. The correct location is Crossroads Church, 212 Jaycee Drive just off Illinois Route 29 on the city's east side. At approximately 5:15 Saturday afternoon, Taylorville was impacted by a tornado causing damage to much of the city. As of 11pm Saturday night 30 patients have been transported to Taylorville Memorial Hospital. However, no fatalities were reported. Taylorville Fire Chief Mike Crews shared an update of the situation in the field addressed in a press conference at 11pm Saturday night, carried live on the Miller Media Group radio stations. Currently, all residents are being asked to stay off the streets, and allow emergency units to drive from place to place as freely as possible. Christian County Sheriff Bruce Kettelkamp with more. Regional Radio News will continue to cover the latest in the aftermath of the Tornado. Updates will come through News Talk WTIM, and TaylorvilleDailyNews.com. Nathan Rybolt from the Stonington Fire Protection District, has informed Regional Radio News that the Stonington fire house is open to all Stonington Fire Protection District residents, if they need shelter after Saturday's tornado. The American Red Cross has set up a shelter at Taylorville High School, for those displaced by the Taylorville tornado Saturday afternoon. The Red Cross has also set up a phone number for volunteers to call to help in the aftermath of the tornado that hit Taylorville Saturday afternoon. That number is: (661) 992-6031. And, the Red Cross has set up a family unification line, to assist family members connect with those they have not heard from as a result of Saturday's Taylorville tornado. That number is: (844) 319-6560. 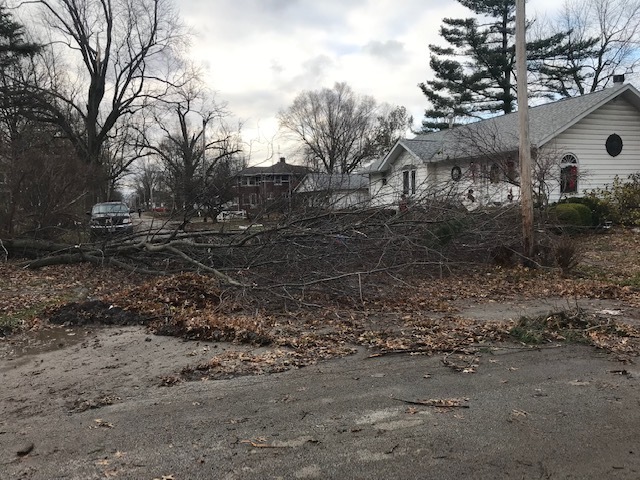 The Taylorville Street Department has announced that they will be at the Christian County Fairgrounds on Sunday morning, to organize volunteers in clearing city streets that have not been cleared of trees and limbs from Saturday's storm. Amy Hagen with the Taylorville Food Pantry, has informed Regional Radio News, that the pantry will be open on Sunday from 8am to 10am for free distribution of food to those who need it following this afternoon's tornado. The Taylorville Food Pantry is located at 1429 East Main Cross. A spokesperson for Ameren Illinois just spoke on-air with the Miller Media Group radio stations, and told our Danny Russell that power in many areas of Taylorville is out due to distribution lines in the city being down. She urged people to stay in their homes, and report any power our gas outages to call Ameren at 800-755-5000. She added that the number of trees blocking roads, has been an hinderance to crews to get to the damaged lines. 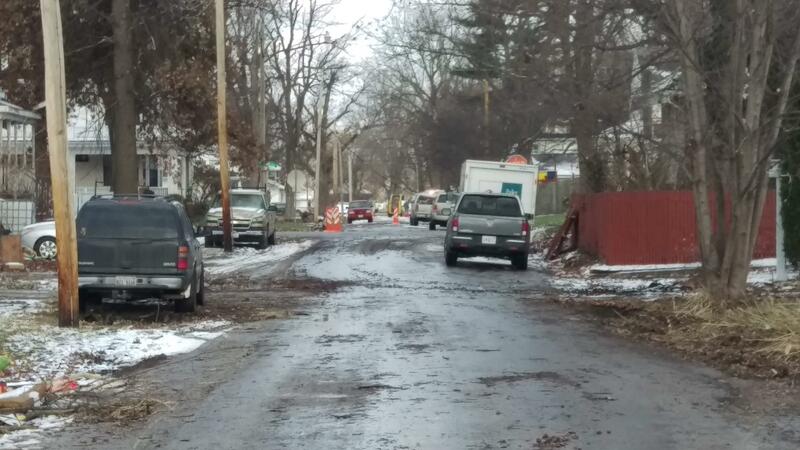 Taylorville mayor Bruce Barry is asking Taylorville residents to stay in their homes tonight and stay out of the way of the emergency crews that are clearing the streets, checking on homes that may have people trapped, and get power crews into restore power. Barry just spoke with Regional Radio News, and said that 15 minor injuries were being treated at Taylorville Memorial Hospital. Stay tuned to the Miller Media Group radio stations for wall to wall coverage. A tornado which the National Weather Service called as catrostrophic, hit Christian County during the 5 o'clock hour this afternoon, with roofs torn off, trees and power lines down. 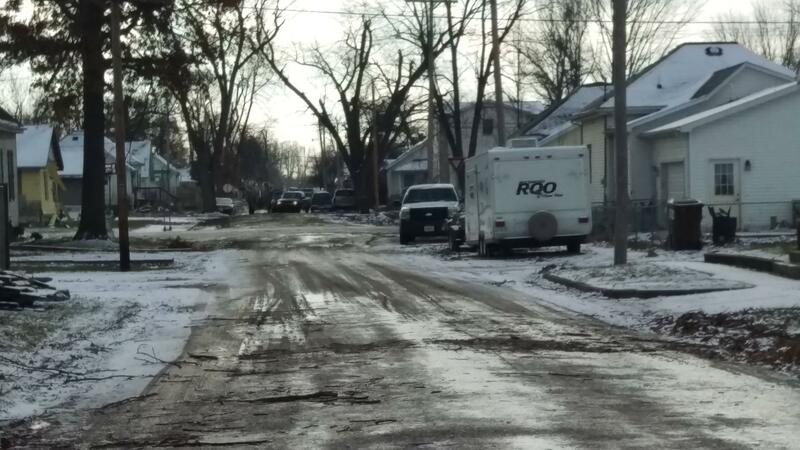 Law enforcement agencies are urging Taylorville residents to stay put, while emergency vehicles and power crews work to get streets cleared, getting to homes that may have people trapped, and get power restored. Illinois State Police are asking motorists to NOT travel to Taylorville until further notice. The Miller Media Group radio stations are doing wall to wall coverage on all 6 of its signals that originate from our Taylorville studios. MINOR ROADWAY FLOODING REPORTED IN TOWN. Stay tuned to the Miller Media Group radio stations as we continue wall to wall coverage thru-out the night. At around 5:30 in the afternoon a tornado touched down in Christian County moving North East at approximately 35 miles per hour. It first hit Morrisonville before making its way to Taylorville, and further North East toward Blue Mound. In Taylorville some houses were severely damaged, and the Taylorville Fire Department has set up a command center at the Fire House. According to Taylorville Fire Chief Mike Crews, some residents have been reported as trapped inside buildings. All emergency crews are working as fast as possible to respond to any and all emergencies. Taylorville Community Credit Union is going to award 2 Taylorville High School Seniors with a $1,000 scholarship. Local residents will have until February 28th to “Stop. SHOP. VOTE!” in TCCU’s 5th Annual Scholarship Program. A total of 35 THS seniors are in the running for the scholarship, and shoppers will have the chance to vote for a student when shopping at participating local business. TCCU President, Will Perkins, says it is way to give back to local communities. Perkins also says that it is a great opportunity for students as well as local businesses. Among those 35 THS Seniors who have a chance at the $1,000 scholarship, there are 35 local business participating. Lincoln Land Community College – Taylorville sponsored a Thanksgiving food drive from November 1st through the 14th in which students and faculty collected non-perishable food items. Tisha Miller, Enrollment Coordinator at LLCC, says this was the third year of the food drive. The participation from students was high, and so was the amount donated. The class who donated the most non-perishable food items was Public Speaking Fundamentals taught by Elizabeth Fines. Their class won a pizza party.